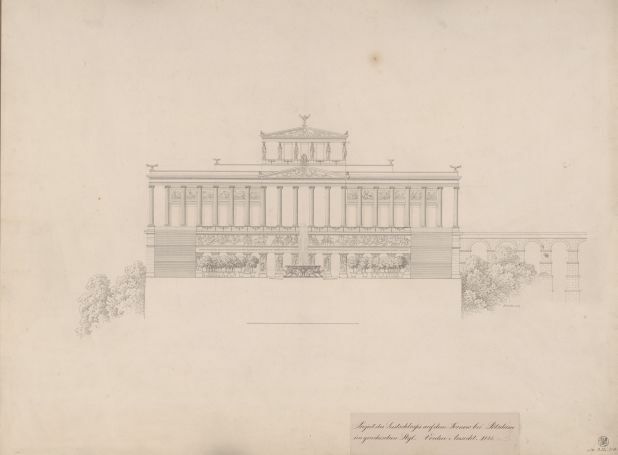 The Schinkel Museum in the Bauakademie was opened in 1844 and remained largely unchanged until the early 1870s. 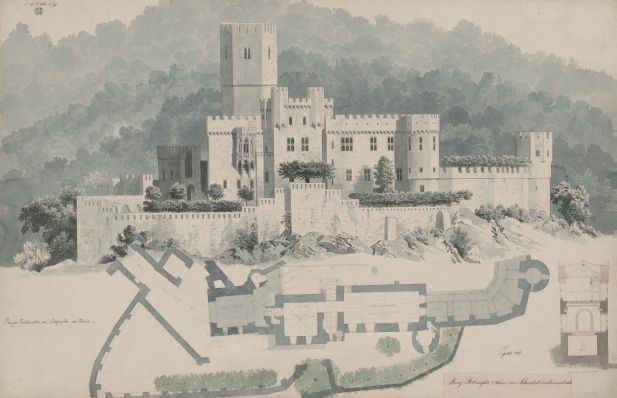 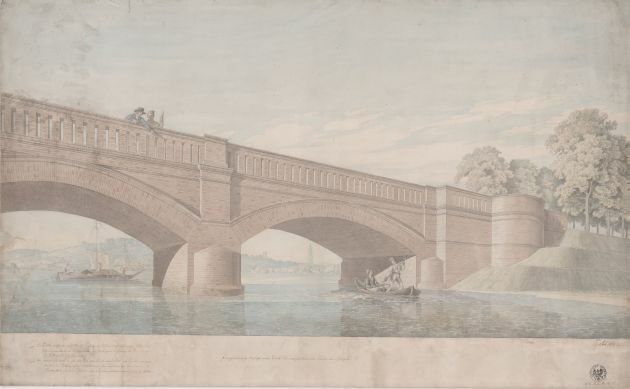 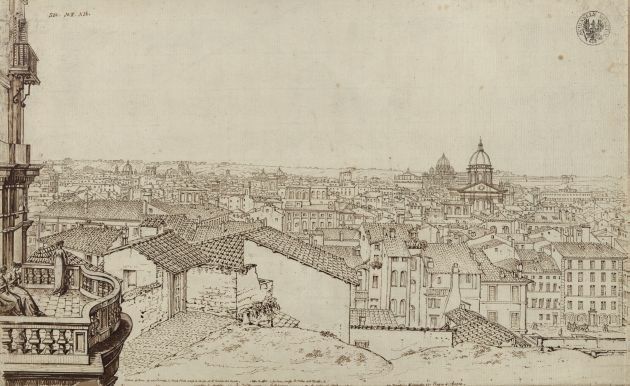 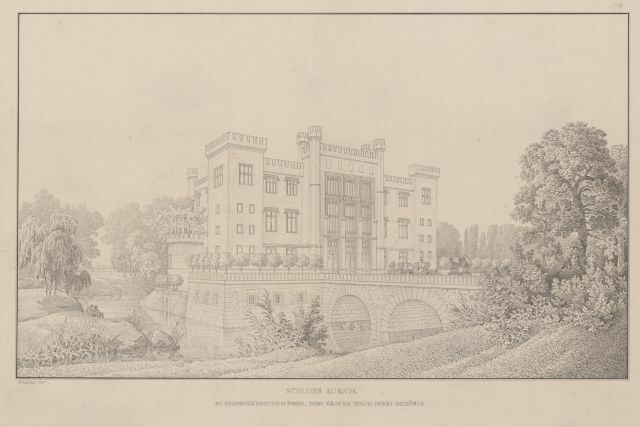 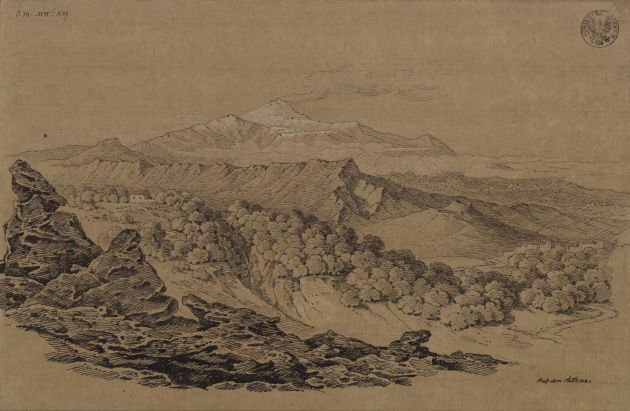 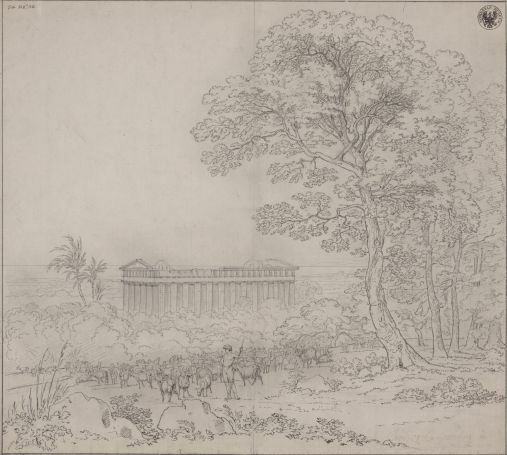 As was customary for collections of works on paper at the time, most drawings and sketches were stored in portfolios and presented to visitors upon request. 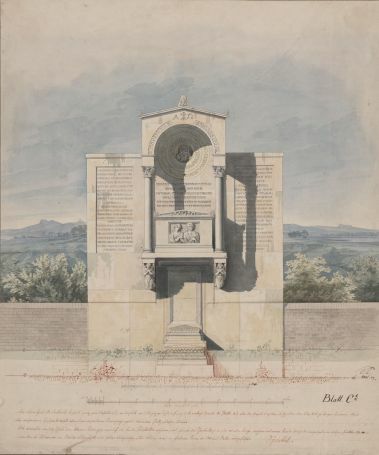 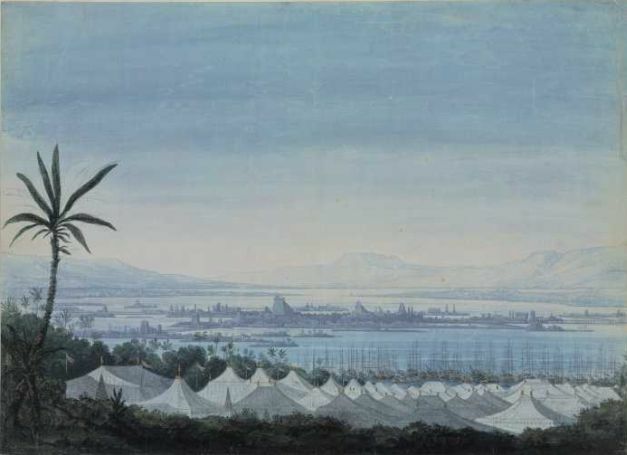 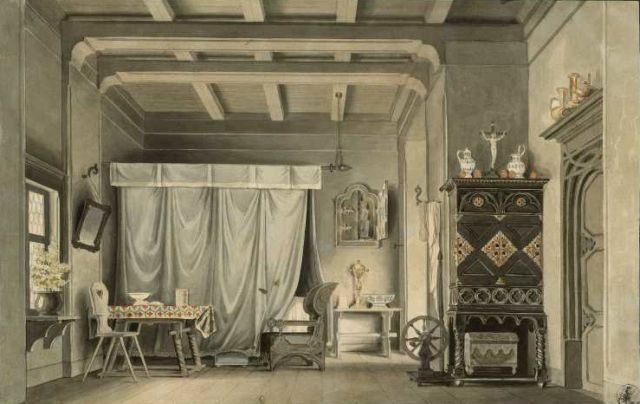 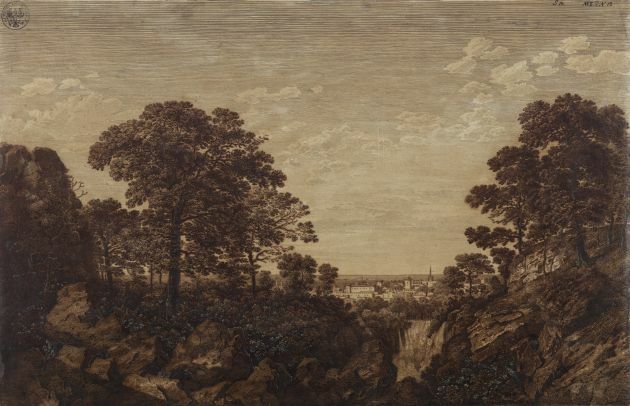 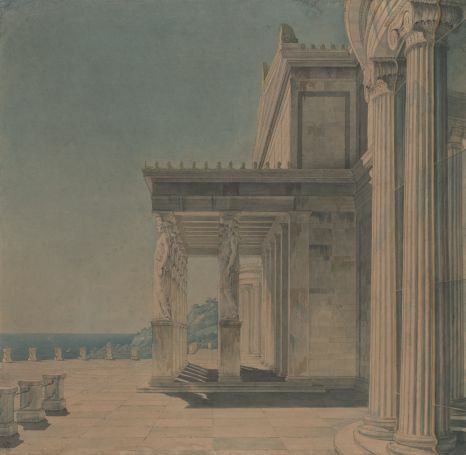 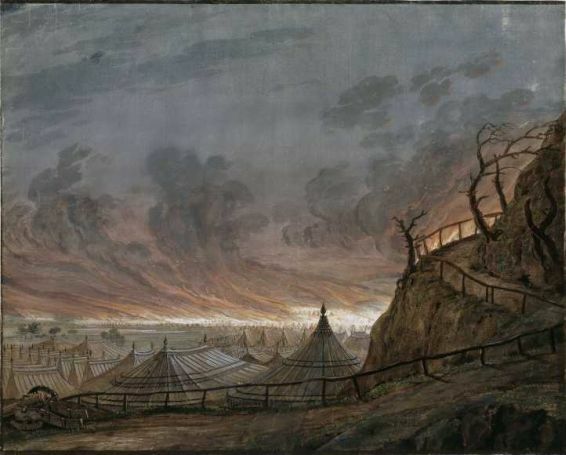 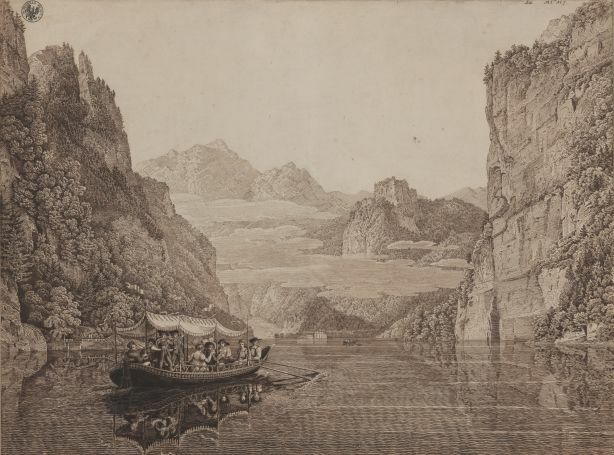 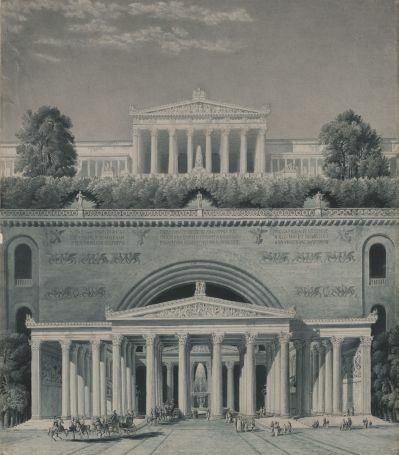 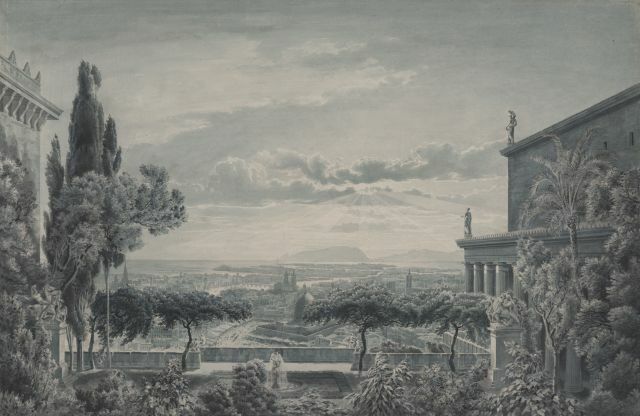 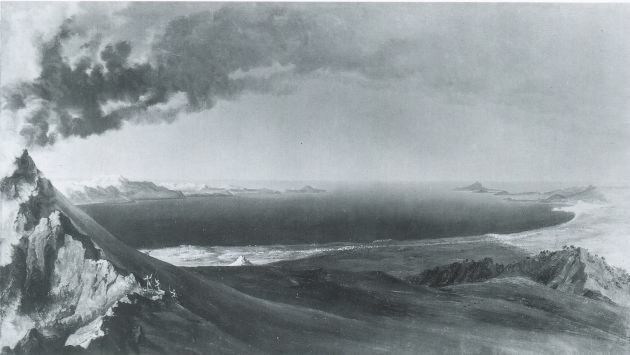 In addition, a representative selection of approximately 120 [core] works by Schinkel was exhibited as a permanent museum presentation, with others displayed on a temporary basis. 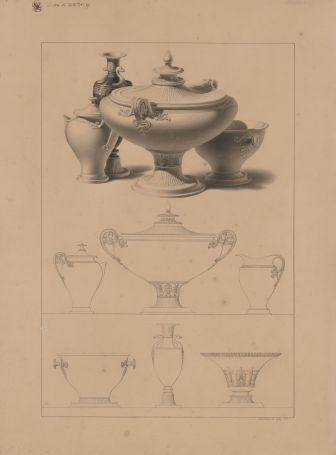 A so-called "glass stand" was specially constructed to house the latter, and probably took the form of a showcase or a revolving stand with mounted frames. 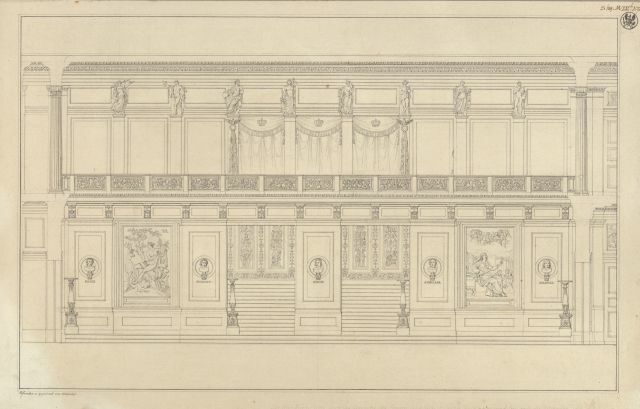 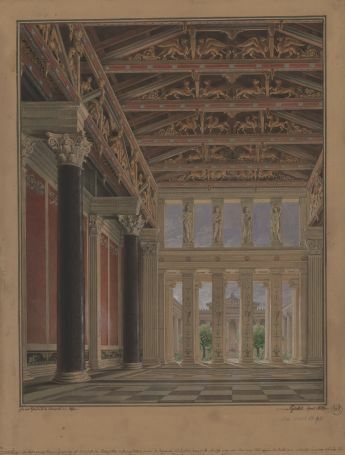 The exhibition spanned the three studies in Schinkel's former residence: the "Red Room" with antechamber, the "Plaster Room", containing Schinkel's collection of casts after predominantly ancient sculptures, and the "Green Room" at the end of the wing, which housed the glass stand. 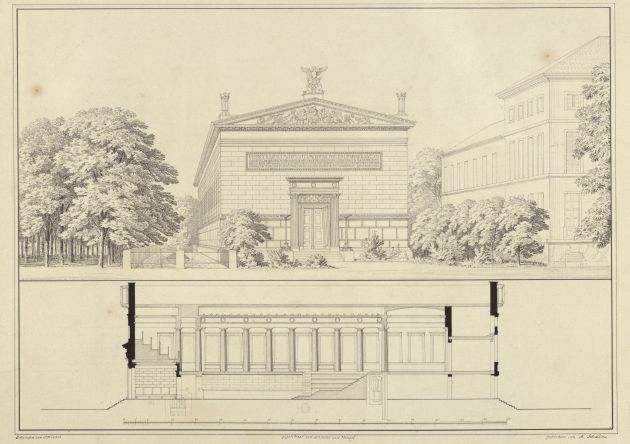 The Plaster Room was the second room in the Schinkel Museum after the Red Room, and was located on the Kupfergraben side of the Building Academy. 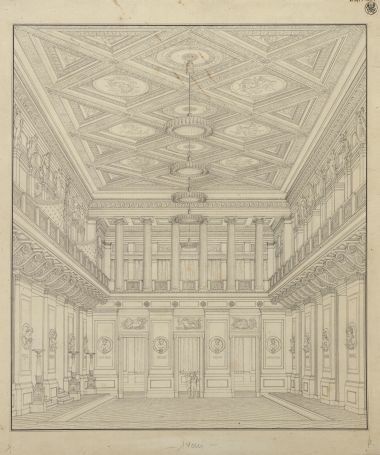 The adjacent plaster room also faced the Kupfergraben side of the Bauakademie. 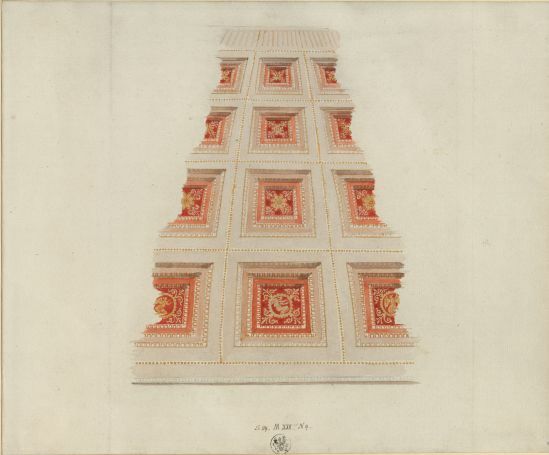 It contained Schinkel's collection plaster casts after ancient models, which were exhibited on half-size wall racks. 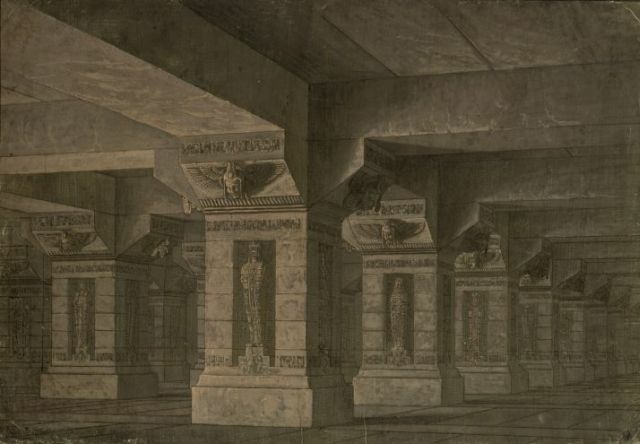 The collection included 35 busts and statues, some of the latter in scaled-down versions. 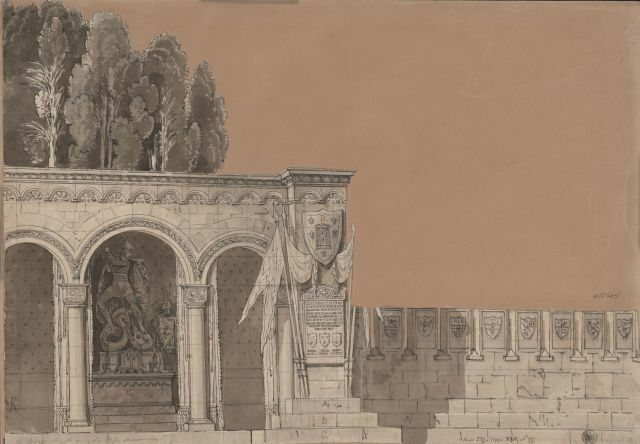 They were joined by a very high-quality plaster cast of a ceremonial sword designed by Schinkel, which hung to the right of the door to the Green Room and is well-preserved with its original sheath. 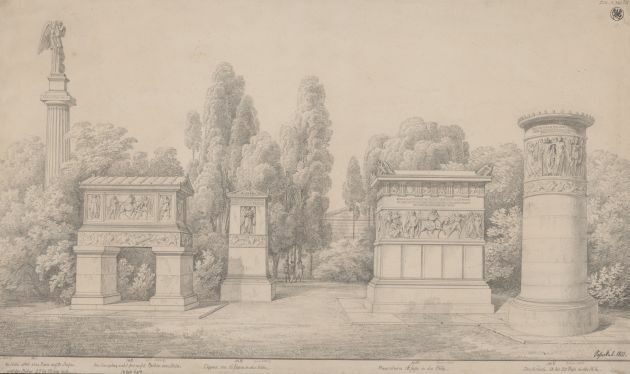 Schinkel's collection of ancient plaster casts however was lost without a trace as early as the 1870s. 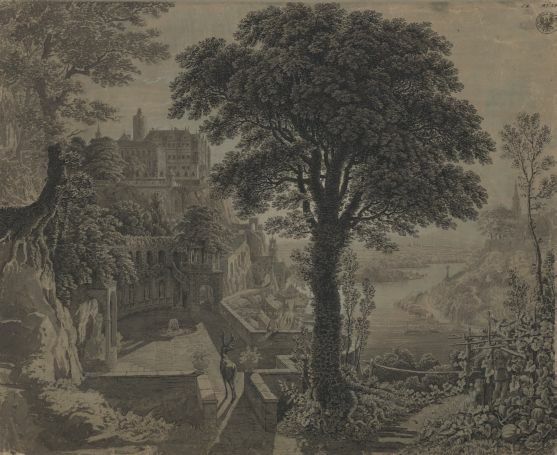 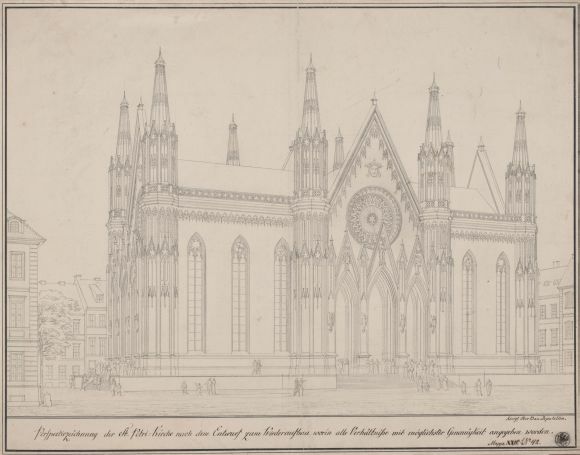 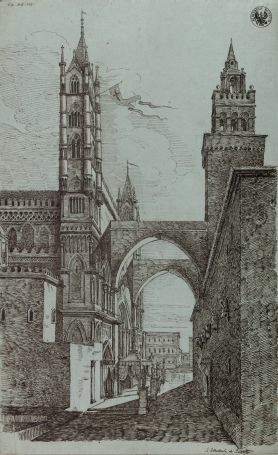 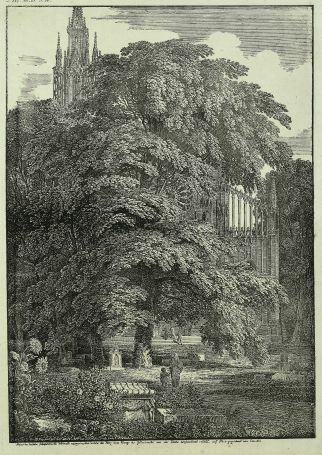 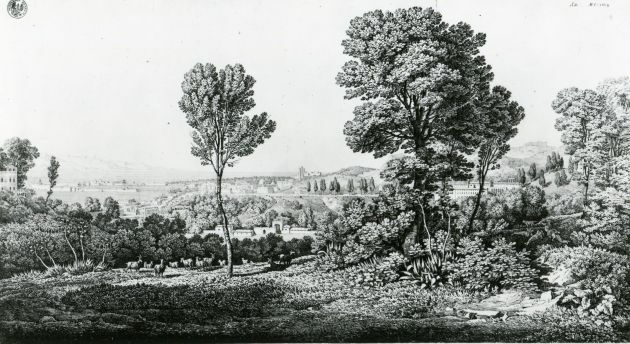 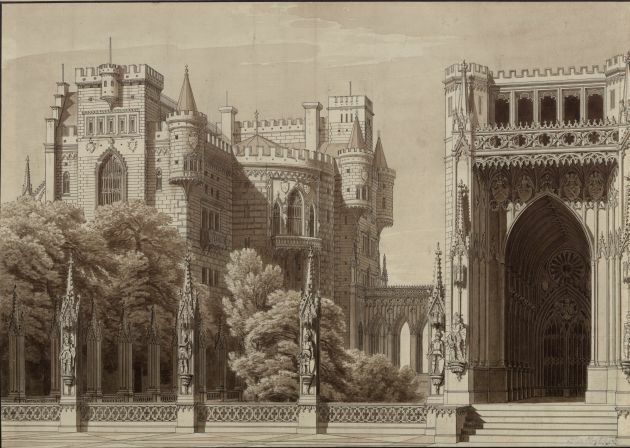 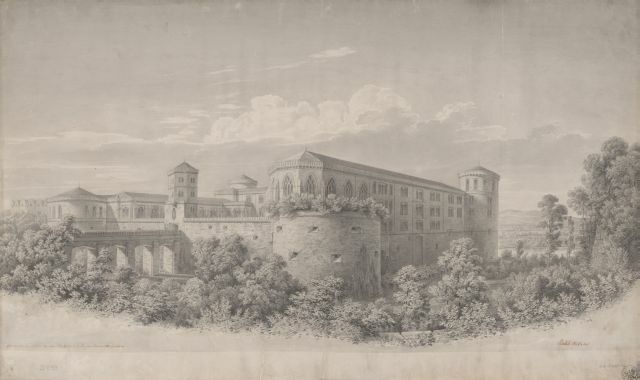 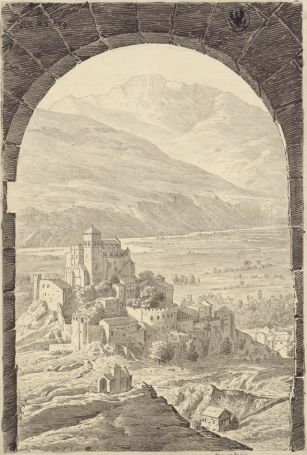 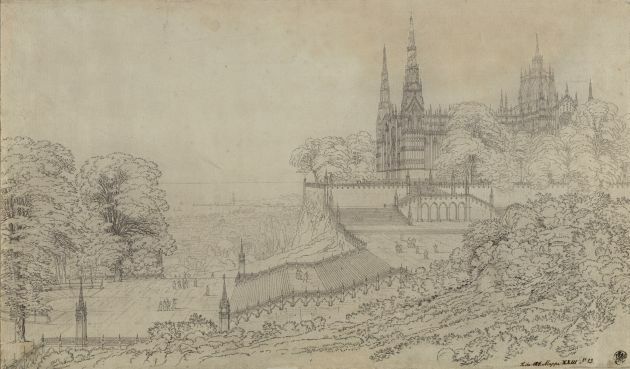 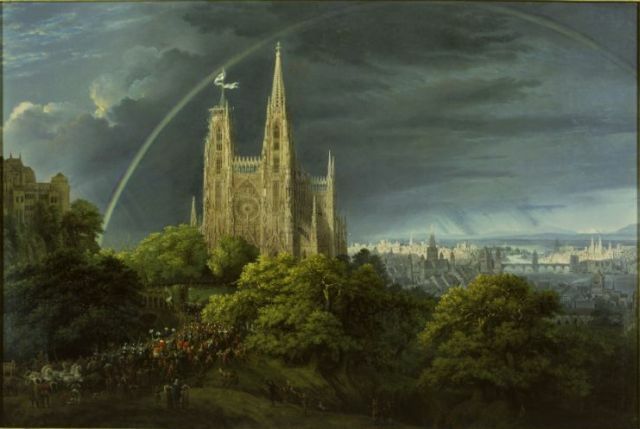 In addition to the sword, works by Schinkel included views of several of his Berlin buildings, and, above all, works dating back to the Napoleonic occupation and the Wars of Liberation, from the famous lithograph "A Gothic Cathedral Behind Trees" (1810) and pair of drawings "Morning" and "Evening" to patriotic works from 1814, such as "Armament for the Wars of Liberation" and "Triumphant Homecoming and Victory Celebration". 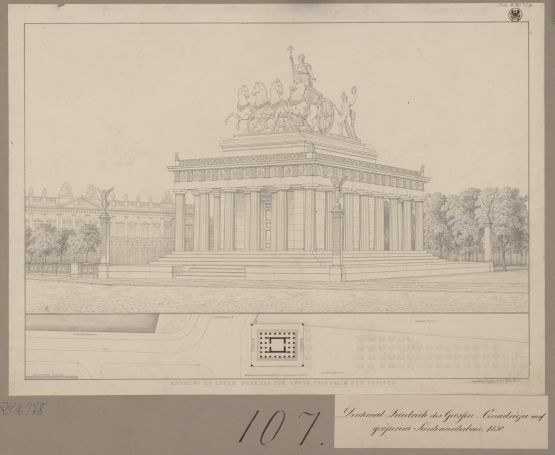 According to the Schinkel Museum’s inventories and catalogue, Schinkel's collection of plaster casts after ancient sculptures amounted to just under three dozen works. 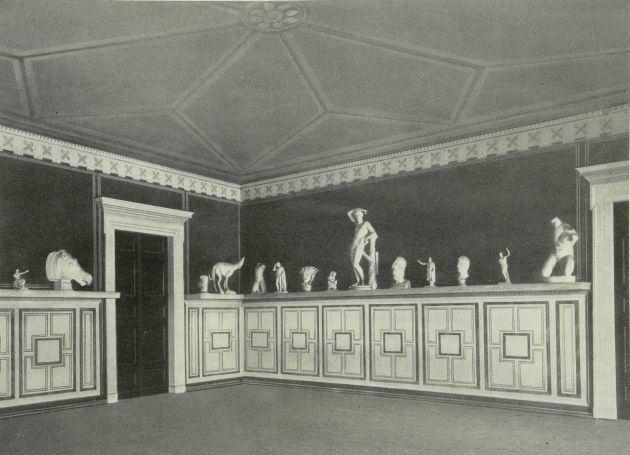 The majority of the collection was displayed on half-size, circumferential wall racks in the Plaster Room, constructed specifically for this purpose. 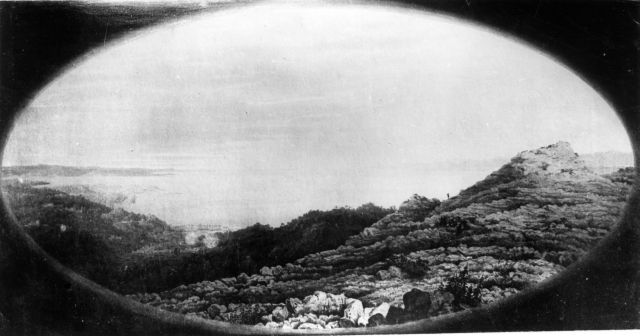 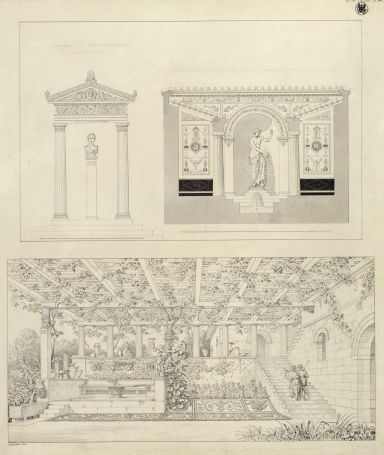 In all probability, the two photographs of the exhibition dating back to approximately 1870 show the display as it was in the 1830s. 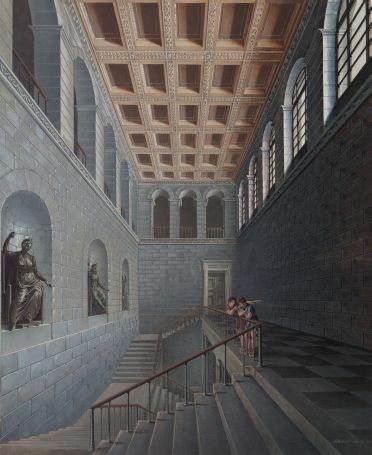 The exhibition was complemented by works such as the colossal head of the "Juno Ludovisi", which were mounted on plinths. 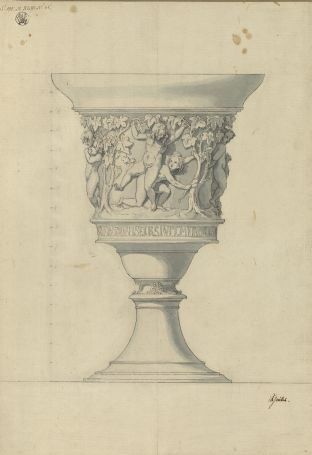 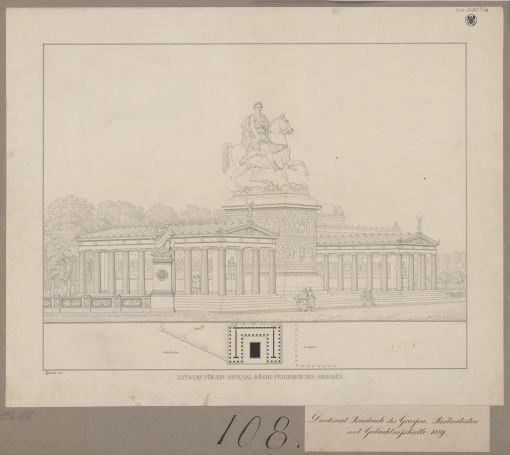 Schinkel's collection of plaster casts and sculptures is now lost, although individual pieces may well be preserved in other collections, such as the collection of plaster casts in Berlin's Antikensammlung (Collection of Antiquities). 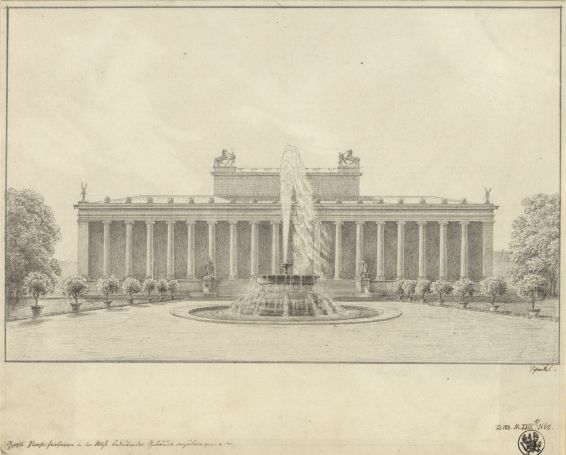 It is likely that Schinkel also owned contemporary sculptural works. 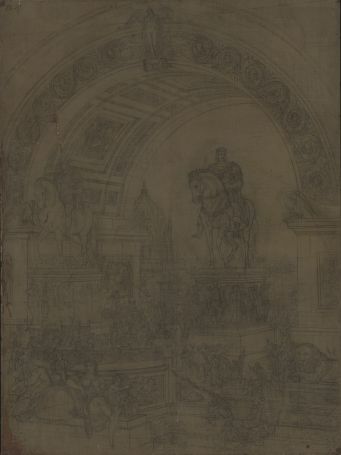 Thus the equestrian statuette displayed below the Ildefonso Group, is likely to be a work by a sculptor from the Berlin school. 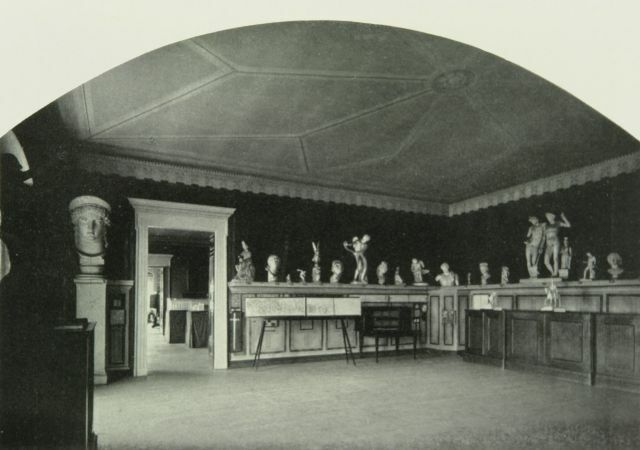 The works are named here as they appear on the two surviving photographs of the Plaster Room. 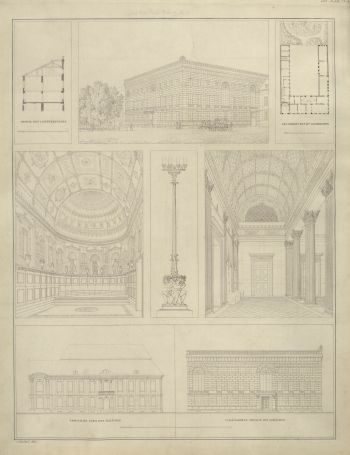 The 1864 catalogue of the Schinkel Museum, in which the plaster casts are listed in blocks in accordance with the order in which they appear on the photographs, was consulted for comparative purposes. 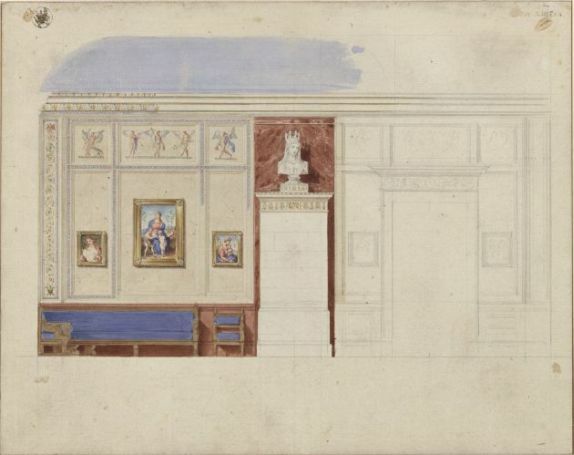 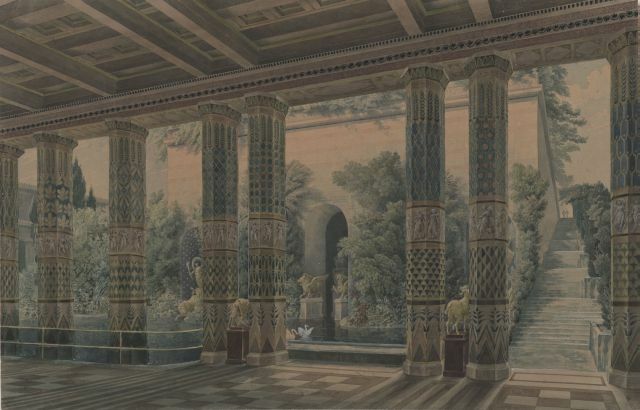 The Schinkel Museum's Green Room contained six drafts of the wall paintings for the Altes Museum (Old Museum) and works created by Schinkel for the theatre. 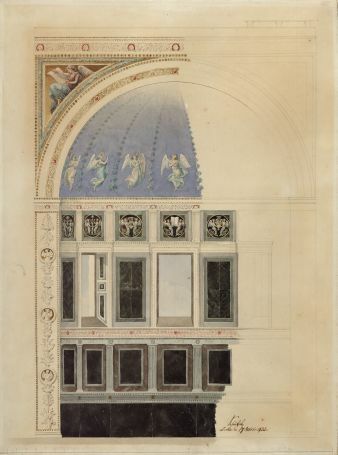 These were complemented by Franz Krüger's portrait of Schinkel, purchased from his [the latter’s] descendants in 1858, taking the amount of coloured works, mostly gouaches, exhibited permanently in the Green Room to 74. 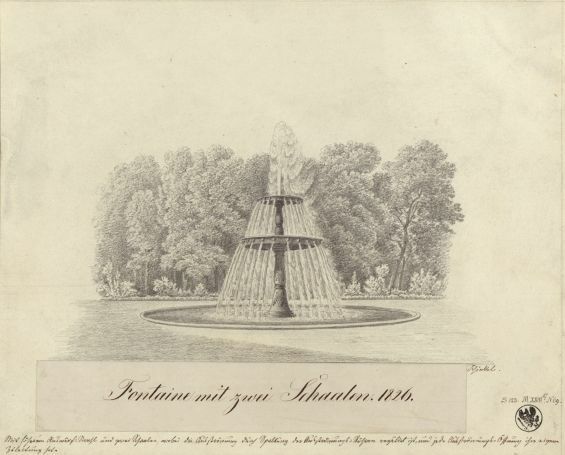 The glass stand for rotating displays was also used. 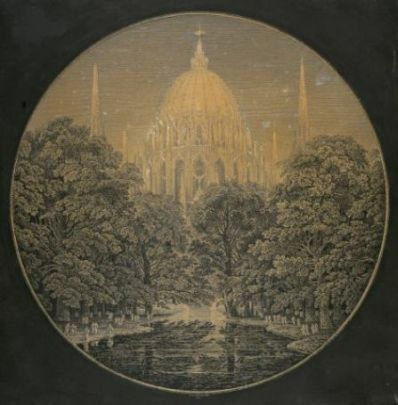 The exhibits were supplemented by three volumes containing a total of 150 photographs of Schinkel's drawings taken and subsequently sold by Berlin photographer Laura Bette between 1858-60 (lost in 1945; a complete series of these rare photographs is kept by the University Library at the Technical University Berlin, Sign. 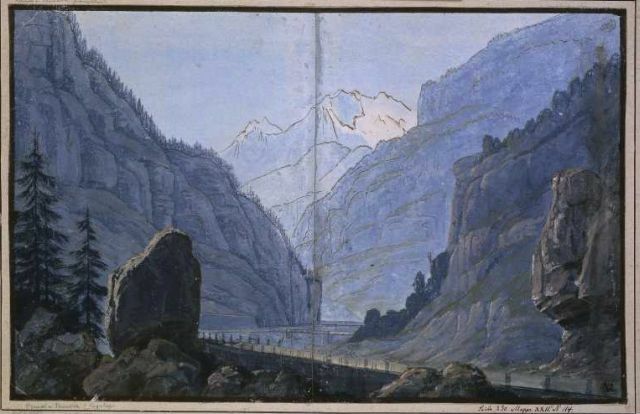 Rara 4 Ba 4528). 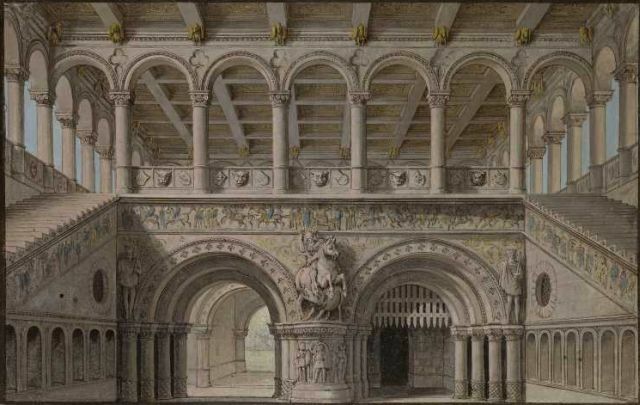 The architectural models previously exhibited in the Green Room are also missing, namely the wooden model of Castle Kurnik south-east of Posnan by Kallenbach and the cork model of the Friedrichswerdersche Kirche (Friedrichswerder Church) by Friedrich Schilling. 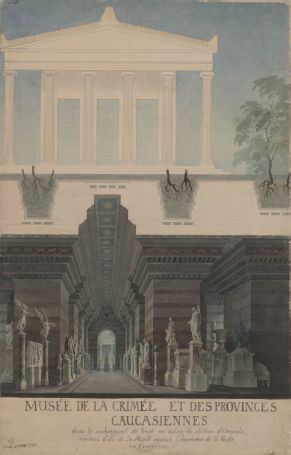 Schinkel always intended to decorate the upper level of the Old Museum's lobby with murals. 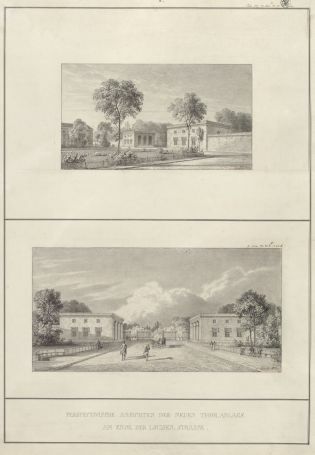 These are implied in a view of the museum dating back to 1823 but were not fully developed until the construction process progressed. 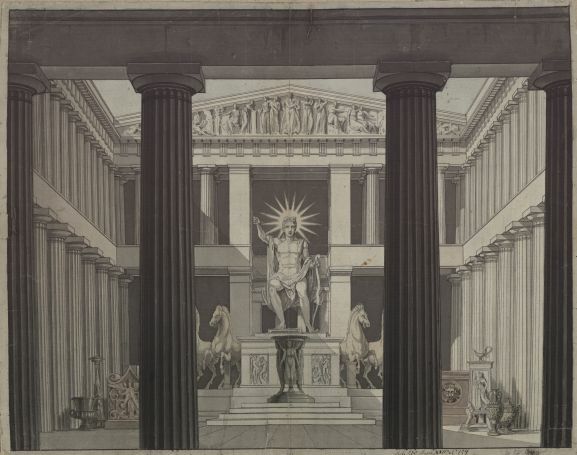 In October 1828, Schinkel presented his design for »Jupiter und die neue Götterwelt« ("Jupiter and the new Pantheon") on the left-hand side of the entrance hall. 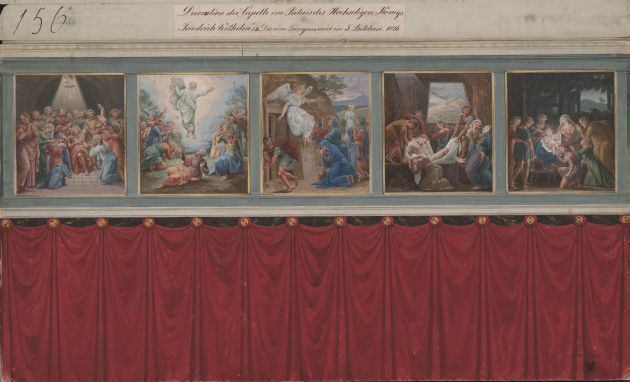 In January 1831, after the museum's opening, he submitted a design for a wall painting on the right-hand wall, entitled »Entwicklung des Lebens auf der Erde vom Morgen zum Abend«. 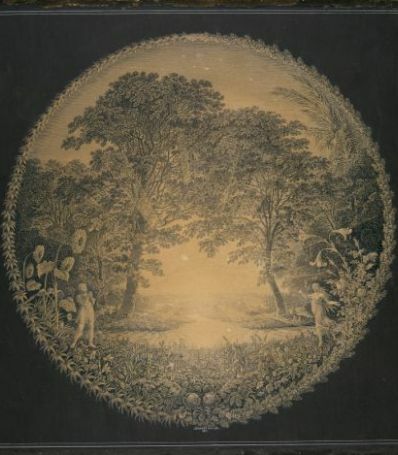 ("The Development of Life on Earth from Morning to Evening"). 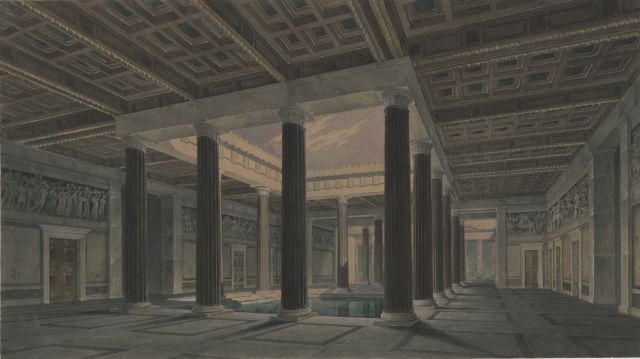 Schinkel created the designs for the murals on the shorter lateral walls of the hall, »Uranus und der Tanz der Gestirne« ("Uranus and the Dance of the Stars") and »Trauer am Tumulus« ("Sadness on the Tumulus"), by November 1831 and January 1832 respectively. 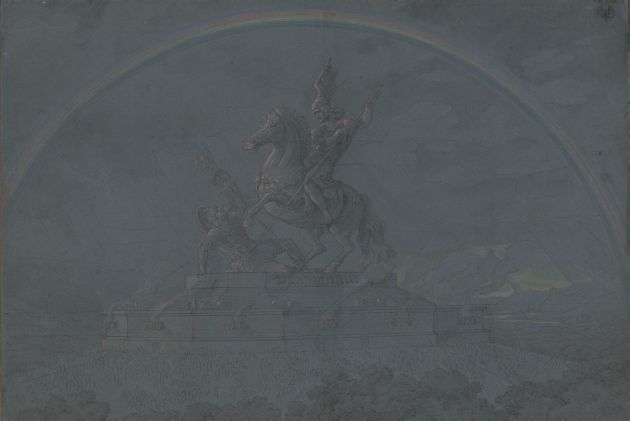 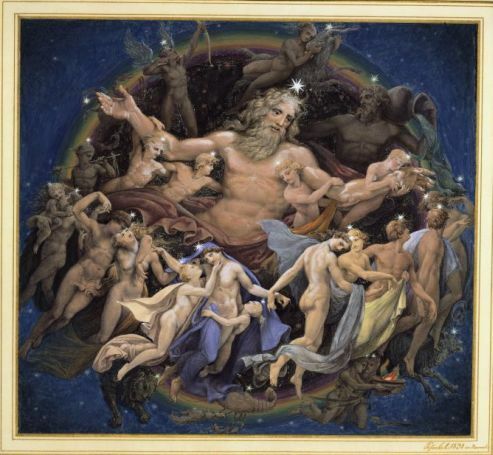 By June 1833 and April 1834, he had presented his designs on the themes of »Naturgewalt« ("Forces of Nature") and »Kriegsgewalt ("Forces of War"), destined for two panels on the staircase. 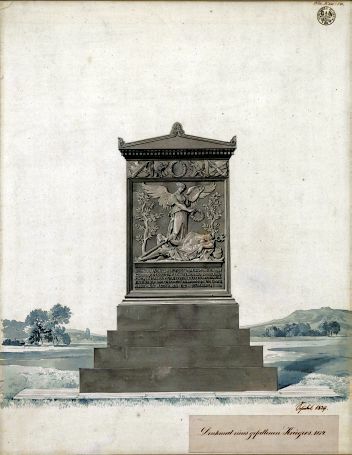 These were entitled the »Aufopferung für Andere bei gefahrenvollem Naturereignis« ("Sacrifice for Others during a Natural Disaster") and »Aufopferung für Andere in Abwehr menschlicher Rohheit« ("Sacrifice for Others in Defence of Human Barbarism"). 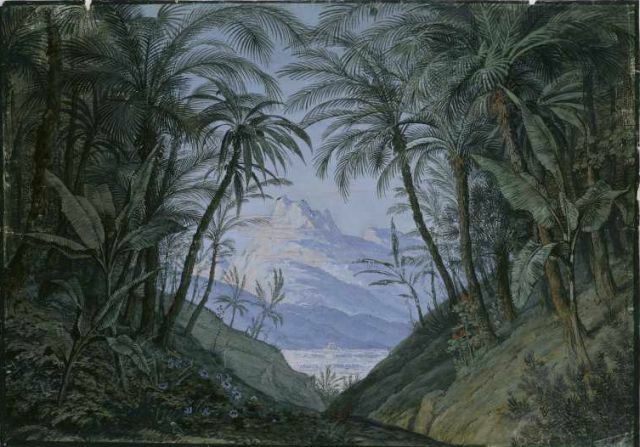 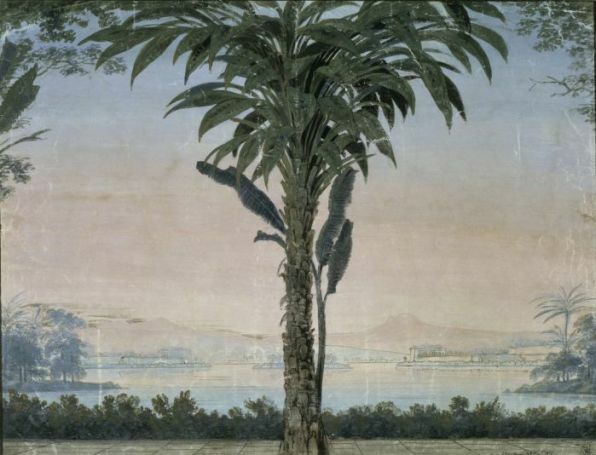 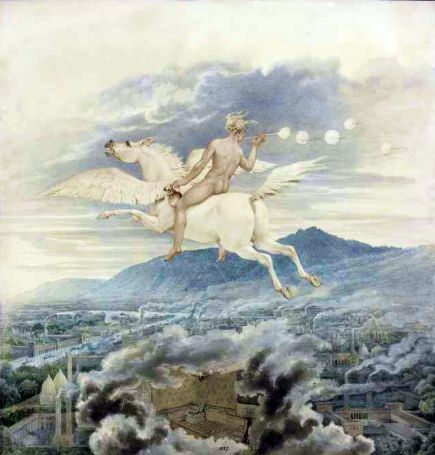 Schinkel also planned frescoes on the themes of “Art” and “Science”. 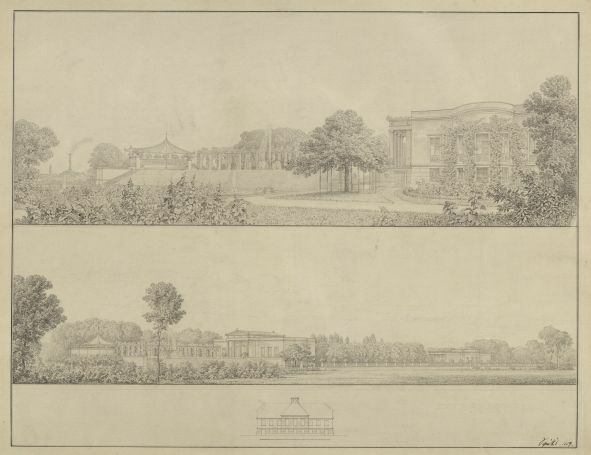 However,these never materialized. 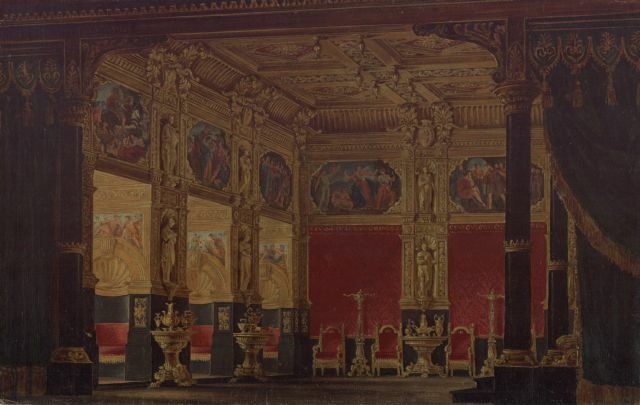 The cycle of murals in the entrance hall was completed between 1840 and 1847 by various painters under the direction of Peter von Cornelius, while those in the upper staircase gallery were not finished until after 1860. 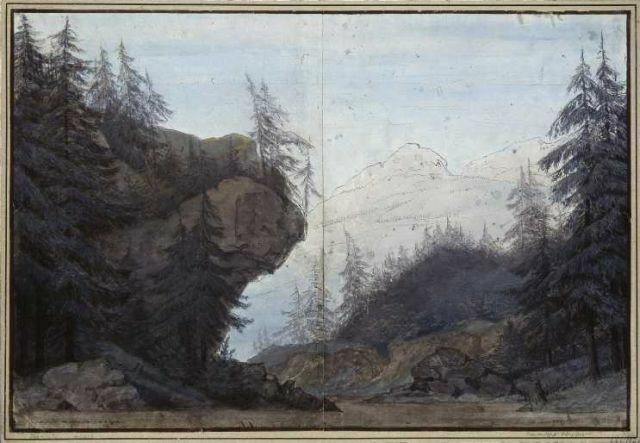 They have now disappeared in almost their entirety,with only some scant remains surviving. 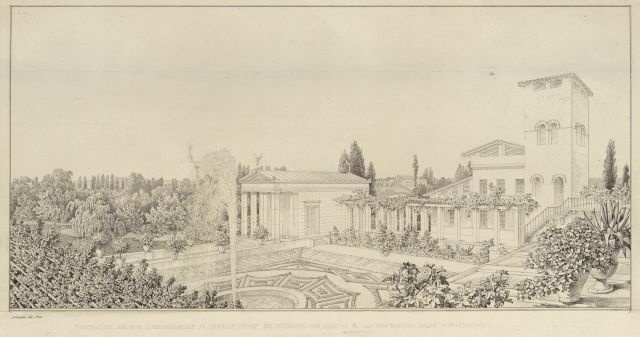 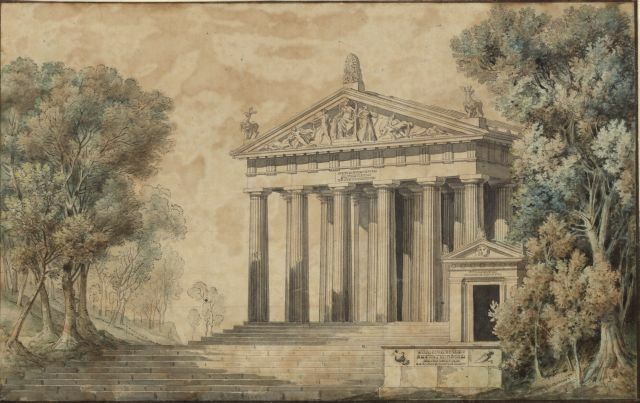 Struggling to find work as an architect, Schinkel in 1813 hoped to be awarded the post of the late stage designer Bartolomeo Verona. 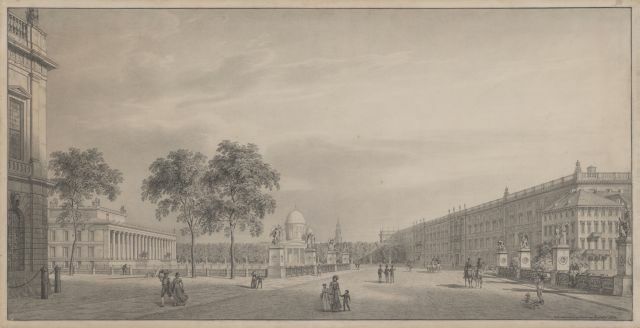 However, only when the direction of the Royal Theatre changed in 1815, and August Wilhelm Iffland was succeeded by Count Karl von Brühl, did Schinkel get the opportunity to work in this area, drawing on the experience gained during his work on the diorama for Wilhelm Gropius. 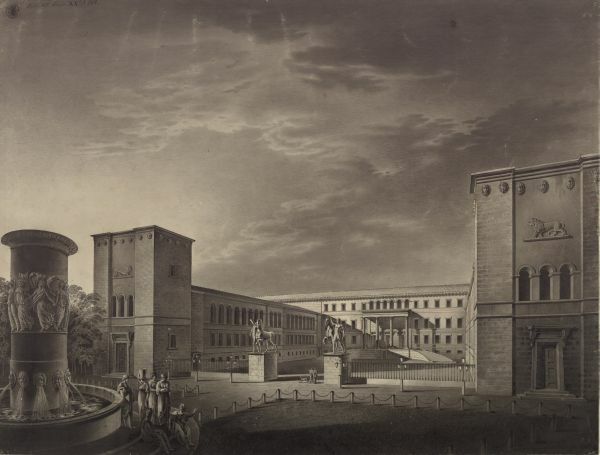 Berlin's theatrical scene, both opera and acting, experienced a golden age under the aegis of Count Brühl, a period of prosperity to which Schinkel contributed considerably. 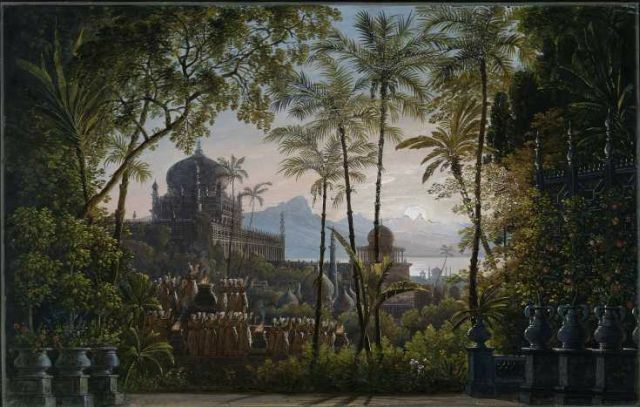 Schinkel created stage settings for approximately 40 operas and plays until around 1829. 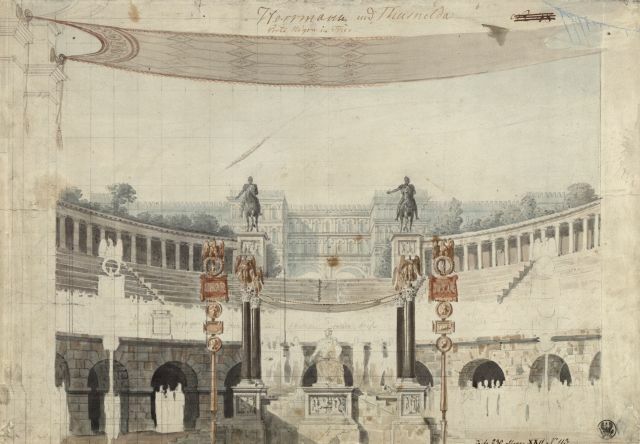 The designs for around 100 stage designs have been preserved. 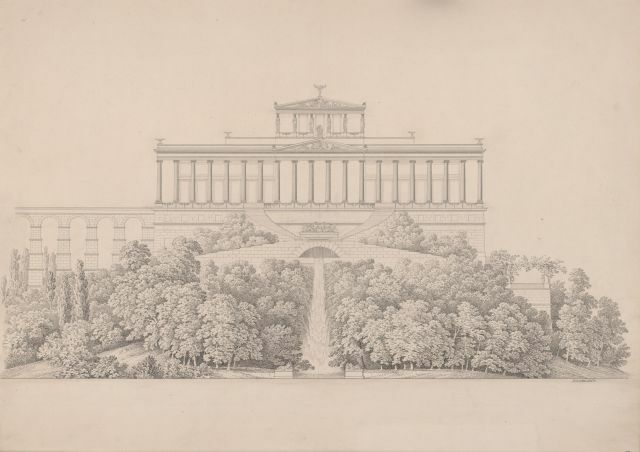 Other than in the Schinkel Museum catalogue of 1864, Schinkel's stage creations are listed chronologically below. 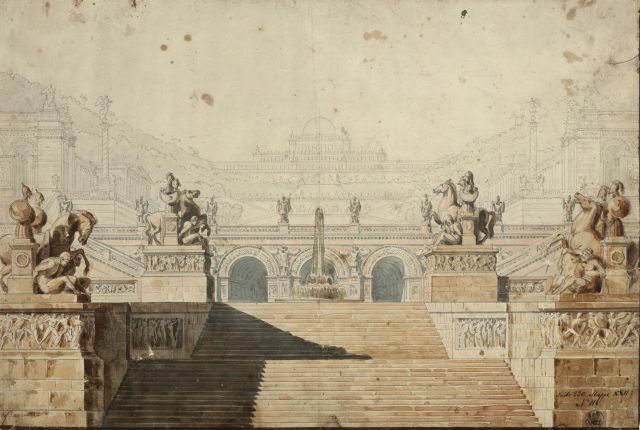 Schinkel designed three stage designs for the Berlin premiere of Etienne Nicolas Méhul's heroic opera "Ariodant", which made its début in Paris in 1799. 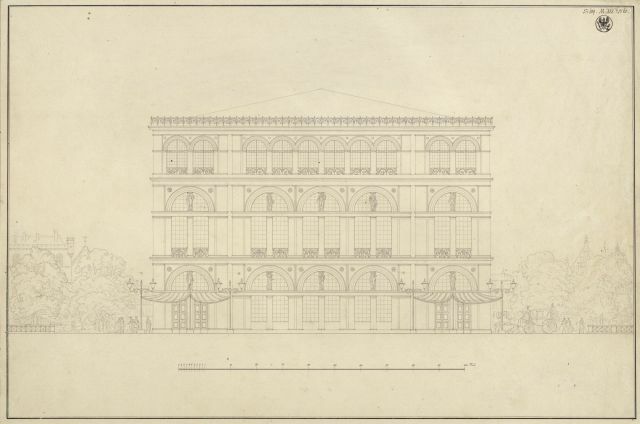 The opera, which enjoyed little success, was discontinued immediately after the premiere on 1st June 1816. 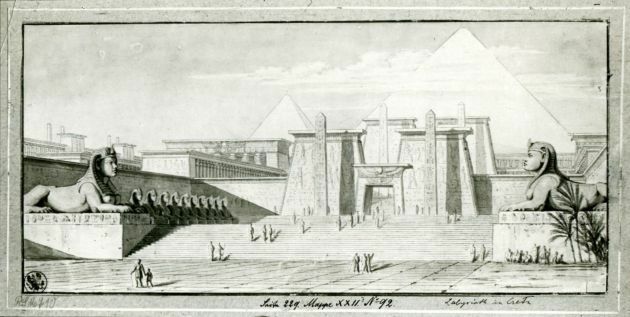 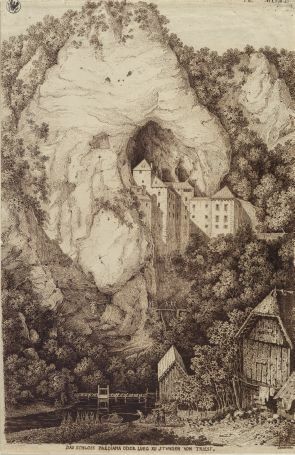 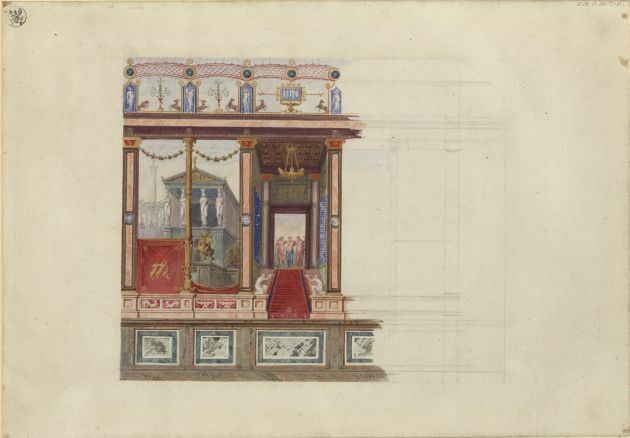 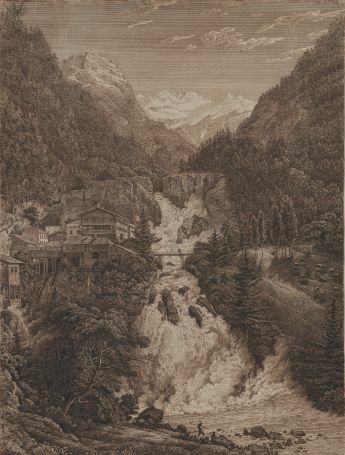 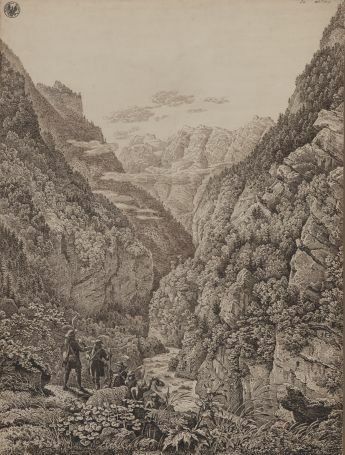 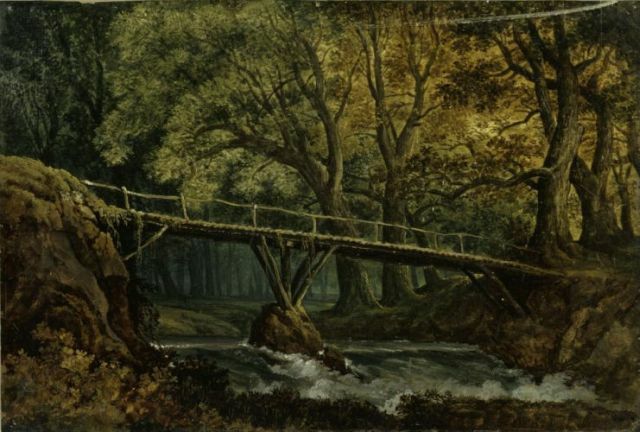 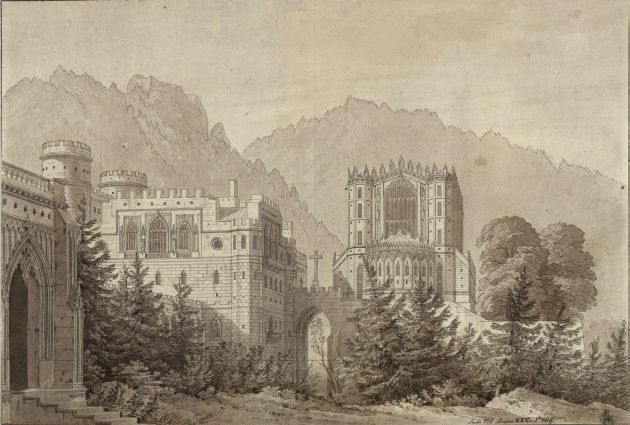 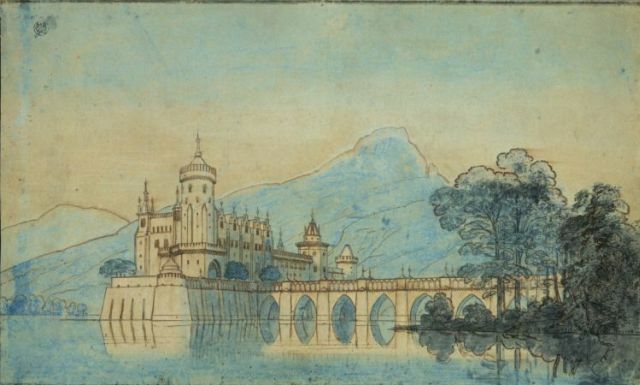 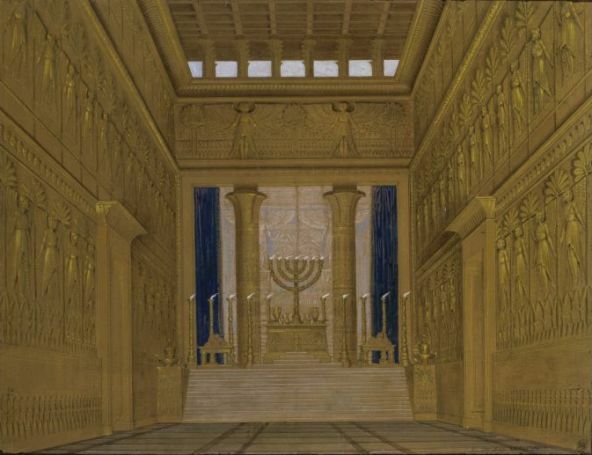 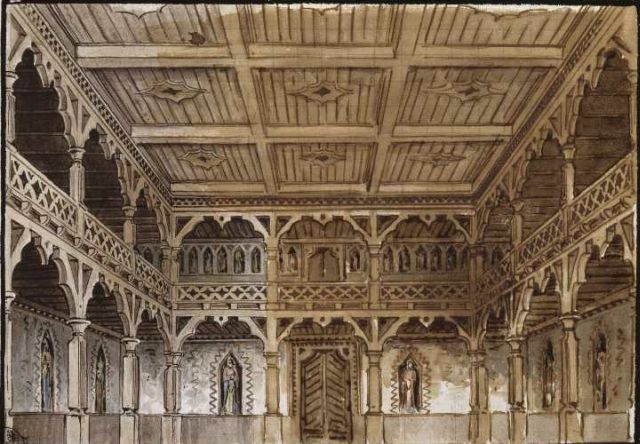 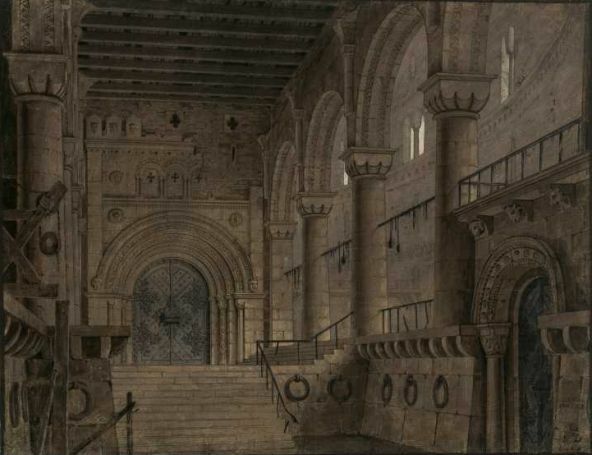 The piece of scenery for a "Large Hall" (3rd set) was consequently re-used in 1817 for Adolf Müllner's play "King Yngurd" (see below). 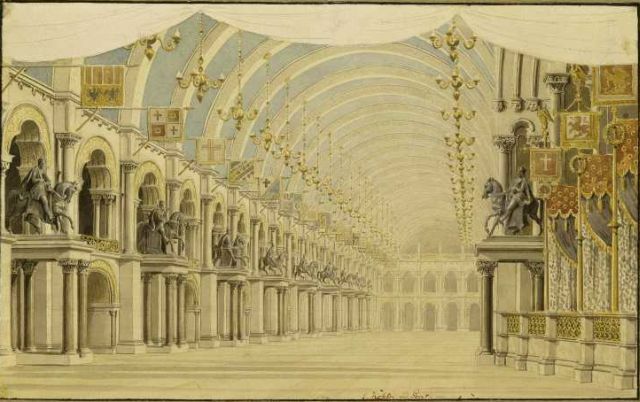 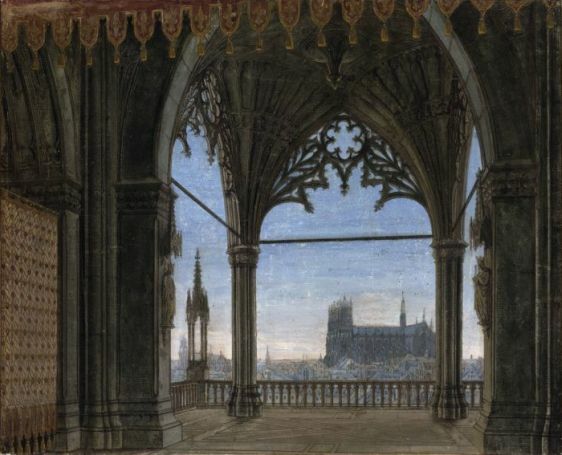 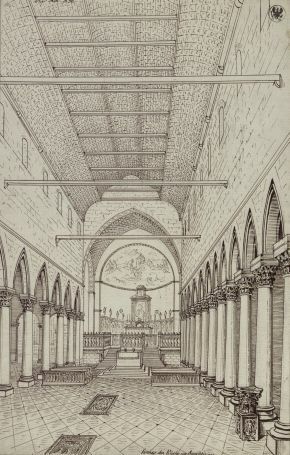 The first stage setting, described as "A gallery transecting the entire theatre" or "Porticus" was also used in other productions, as indicated by a memorandum by Schinkel on the design - "Architecture for plays set around the 8th century". 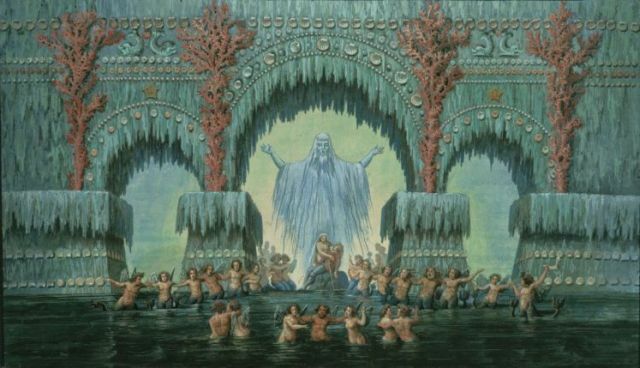 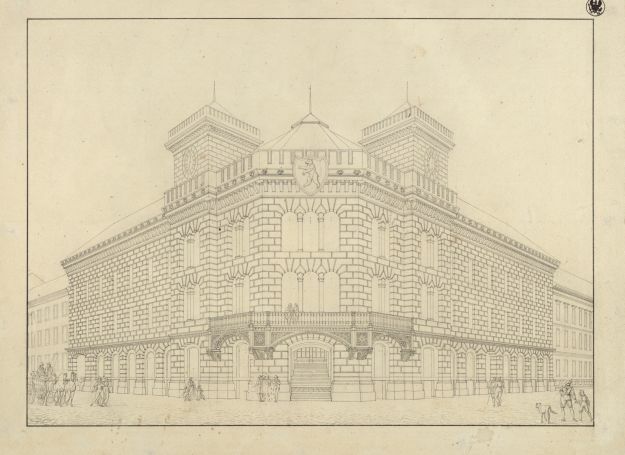 Schinkel created seven stage designs for the world premiere of E. T. A. Hoffmann's magical opera "Undine" on 3rd August 1816, the birthday of King Frederick William III, which was staged in the former National Theatre designed by Carl Gotthard Langhans, located in Berlin's Gendarmenmarkt square. 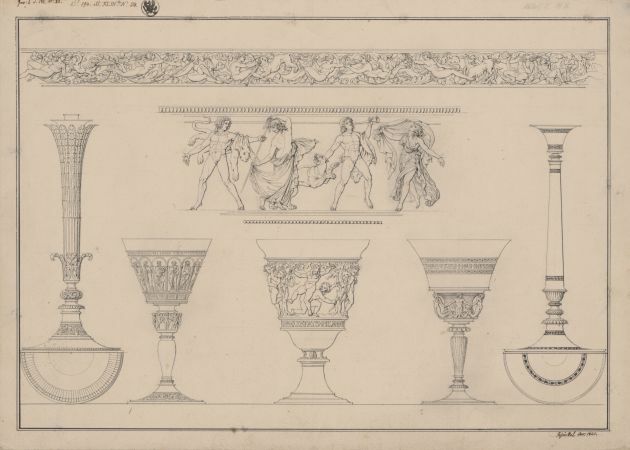 Five designs have survived. 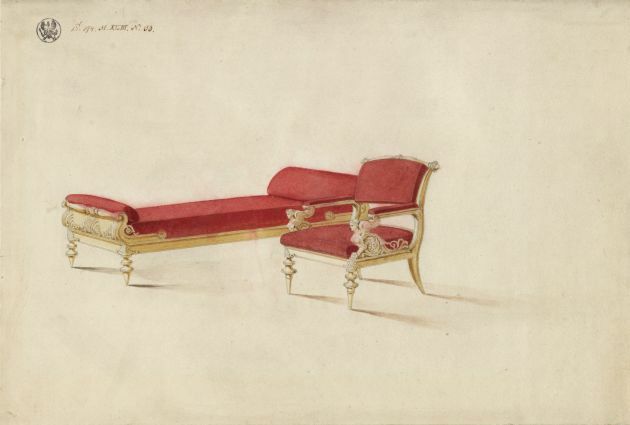 Three further sets from the props collection were used for the opera, whose libretto was written by Friedrich de la Motte Fouqué, who reworked his 1811 tale of the same name according to a sketch by Hoffmann. 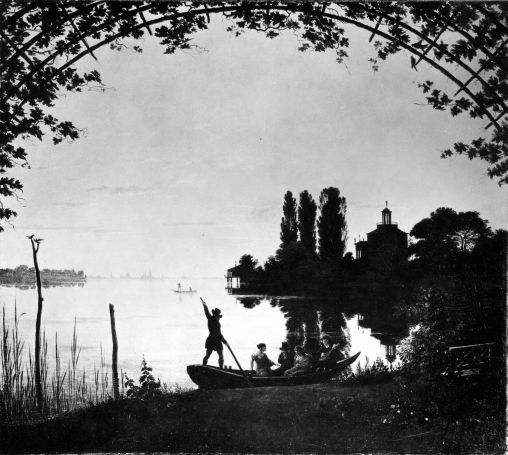 "Undine", Germany's first Romantic opera, was Hoffmann's greatest operatic success and made his name as an opera composer. 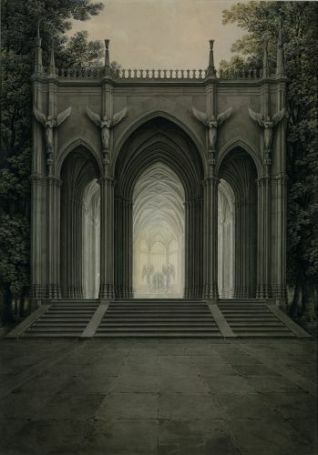 Schinkel created a stage set for the premiere of Kleist's "Käthchen of Heilbronn". 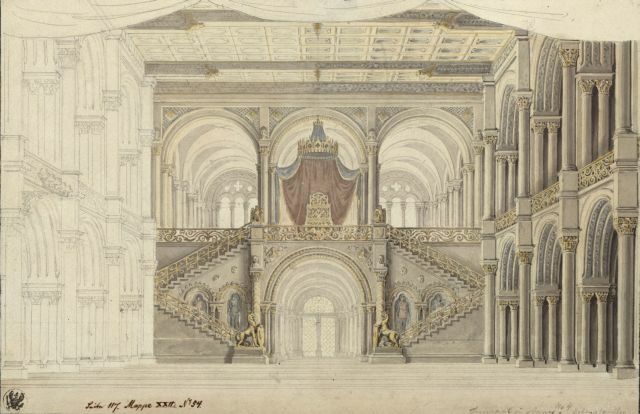 It is likely that the design was created for a premiere of the play initially planned for 1816. 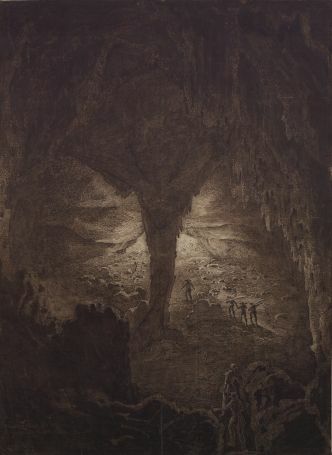 It was published in 1819 and may have been used during the Berlin premiere in 1824. 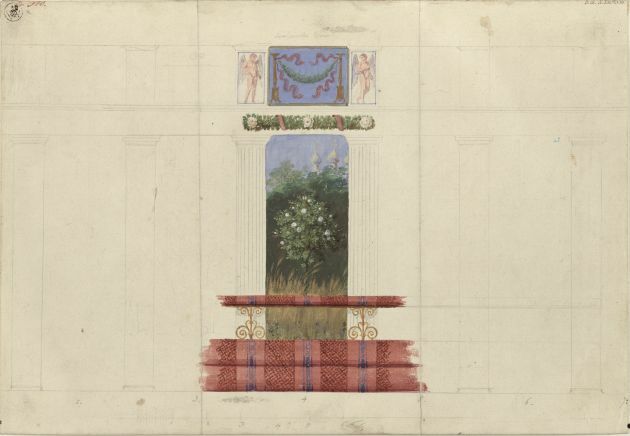 The stage set had probably been in the props collection for a relatively long period, and had been used in other plays. 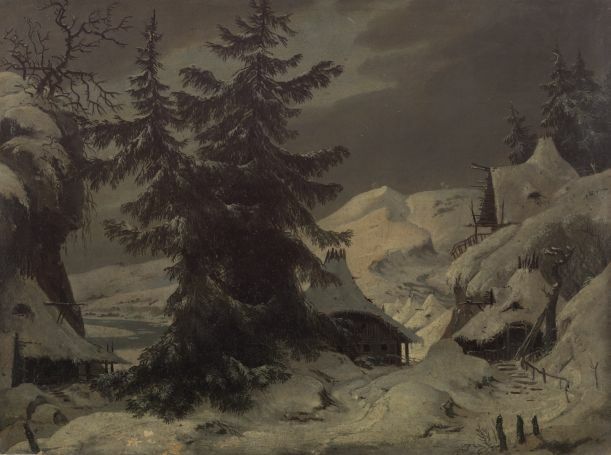 The Berlin premiere of Johann Nepomuk von Poißl's now obsolete opera took place on 25th February 1817 (libretto by Gottfried Wohlbrück, free interpretation of Racine's 1691 play "Athalie"). 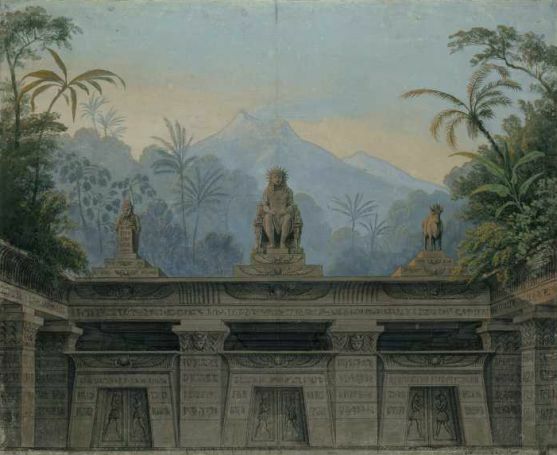 Schinkel created three stage sets for the performance, while two others were taken from the props collection. 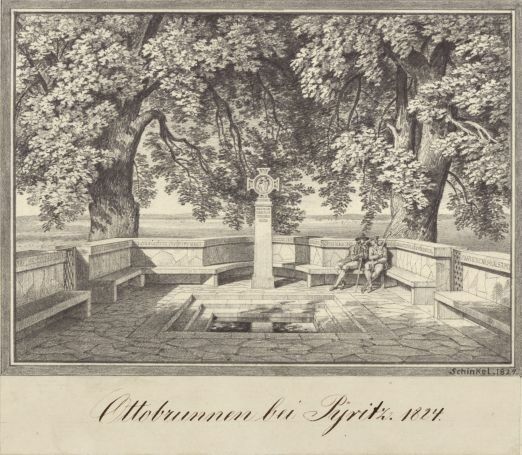 The Berlin premiere for Adam Oehlenschläger's tragedy »Axel und Walburg« took place on 28 April 1817. 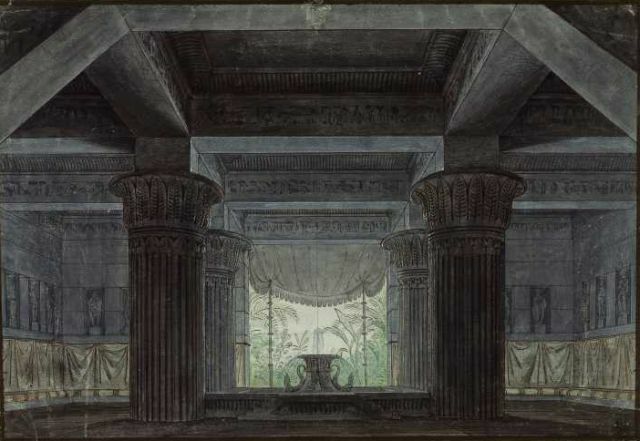 The play requires only one stage setting, which was designed by Schinkel. 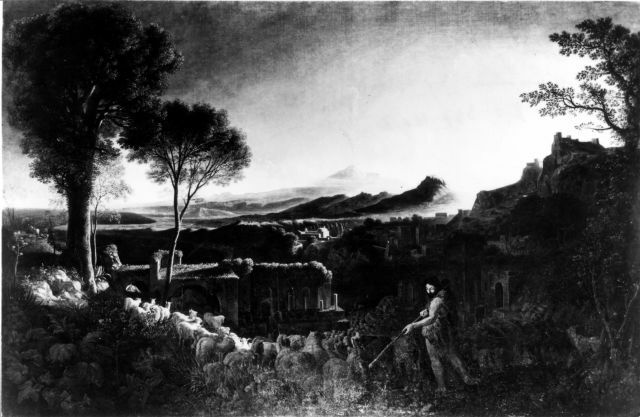 Adolph Müllner's four-act tragedy celebrated its premiere on 7th June 1817. 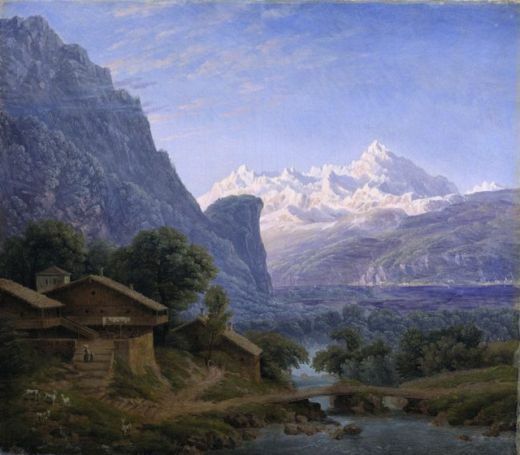 Carl Maria von Weber composed the score. 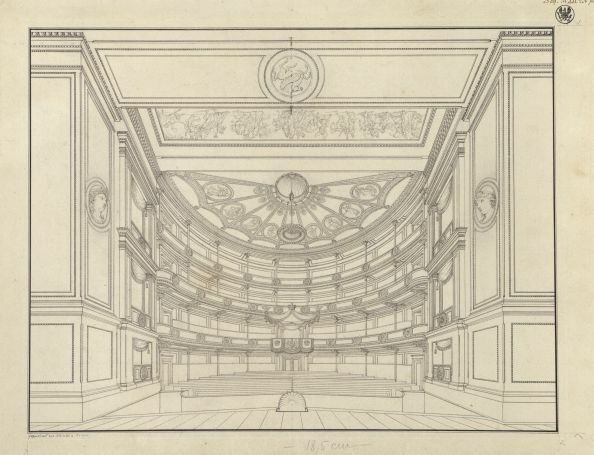 Schinkel created all the designs for the performance, although the first stage setting, for a "Large Hall", had been built the year before for Etienne Nicolas Méhul's heroic opera "Ariodan". 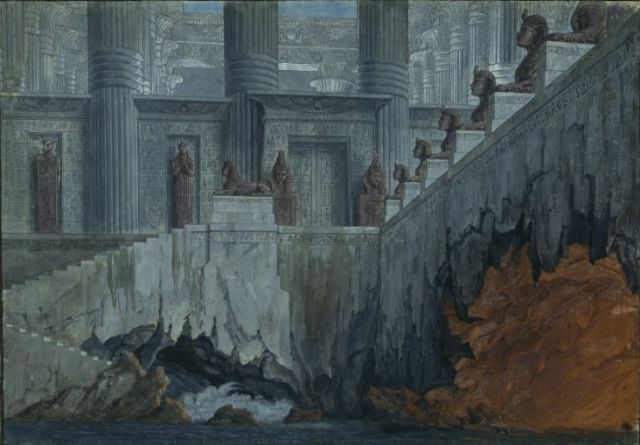 After Méhul's opera was cancelled after just one performance, the set was re-used in "King Yngurd". 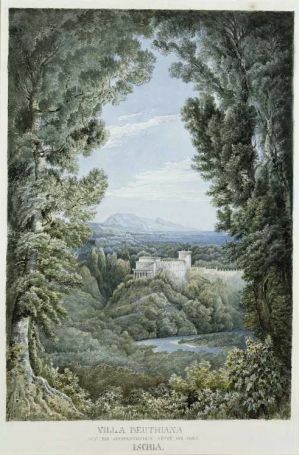 After initial performances of the Italian version of Christoph Willibald Gluck's tragédie lyrique "Alceste" in Berlin in 1796, the French version, which had been altered musically and lyrically by the composer, premiered on 15th October 1817, the birthday of Crown Prince Frederick Wilhelm (IV) (German text by Carl Alexander Herklots). 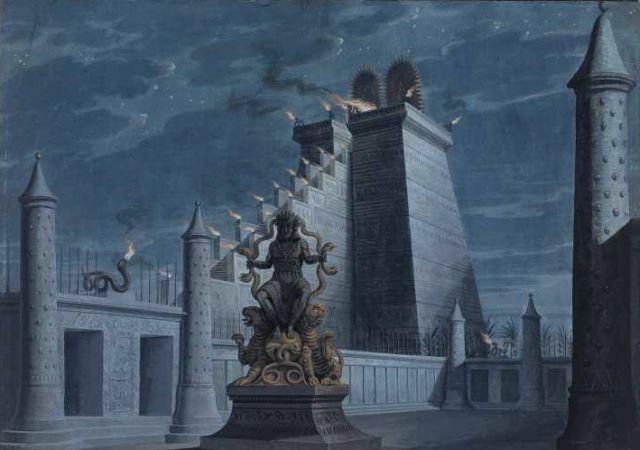 Schinkel created two new stage sets for this performance. 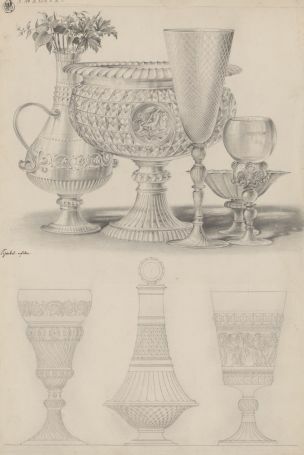 The remaining three were taken from the props collection. 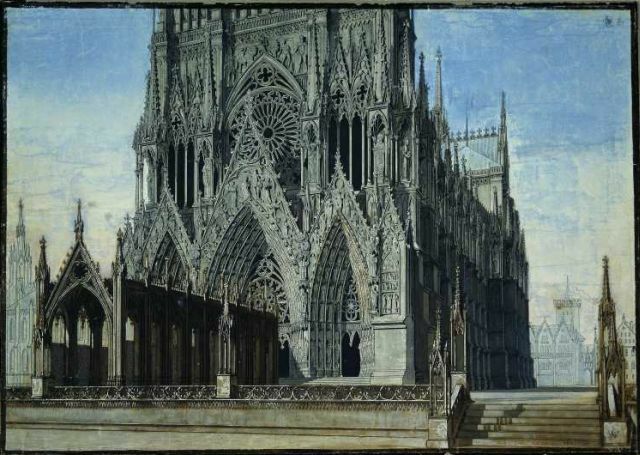 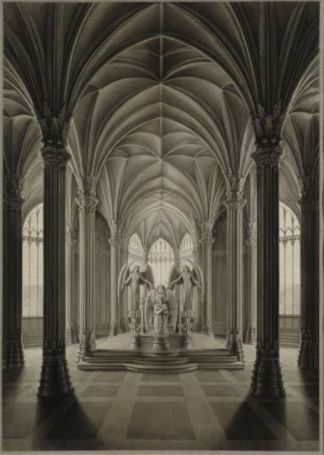 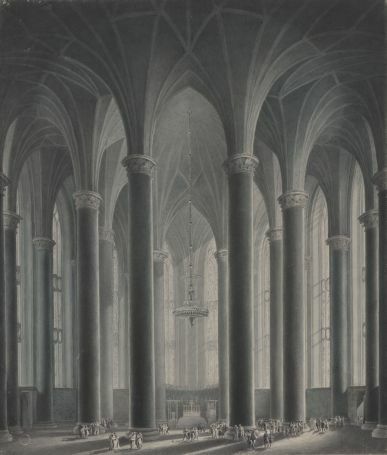 Schinkel created three stage sets for the new production of Schiller's tragedy "The Maid of Orleans" in 1817/18. 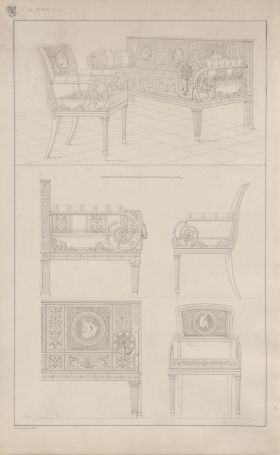 The remaining seven sets were taken from the props collection. 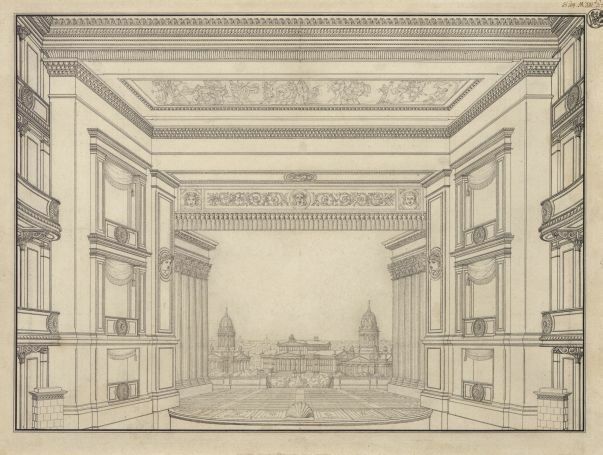 The play's premiere using Schinkel's stage sets took place on the occasion of the Prussian Coronation Day on 18th January 1818. 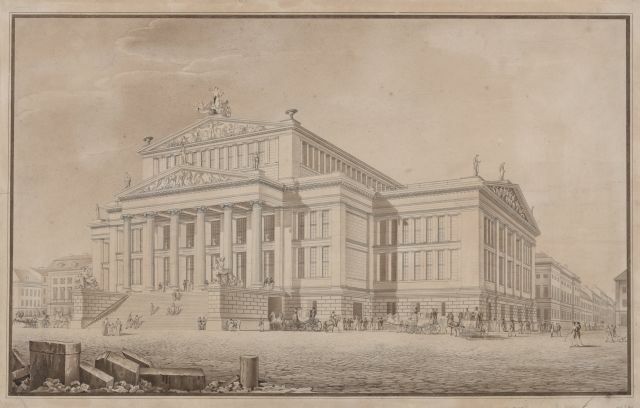 The premiere was performed in the Opera House after the National Theatre in Gendarmenmarkt square was destroyed by fire on 29th July 1817. 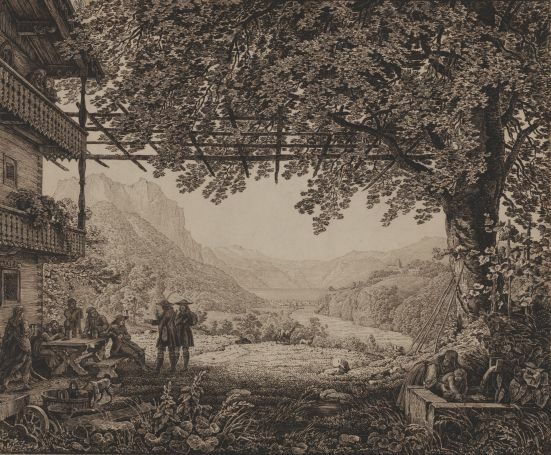 Kotzebue's five-act play, "Count Benjowsky or the Conspiracy on Kamschatka", which was published in 1795, premiered in Berlin in 1798. 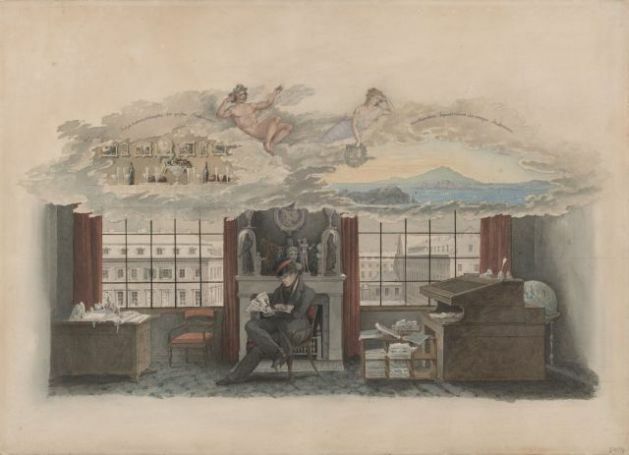 50 further performances followed until early 1818. 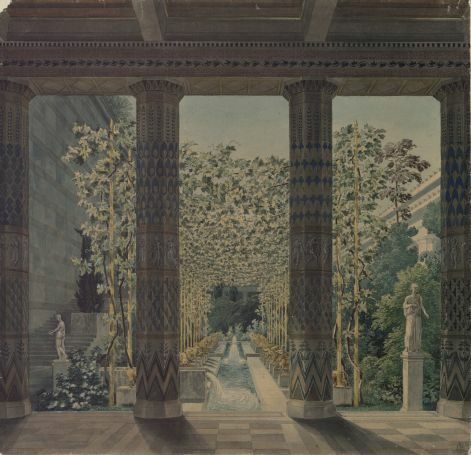 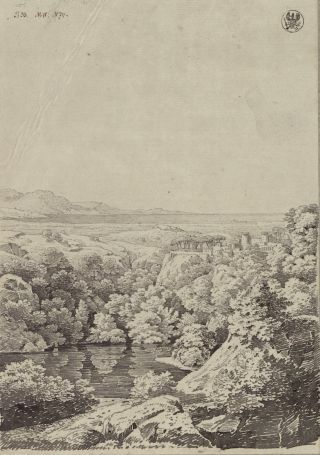 Schinkel possibly created a new stage set in the summer of that year. 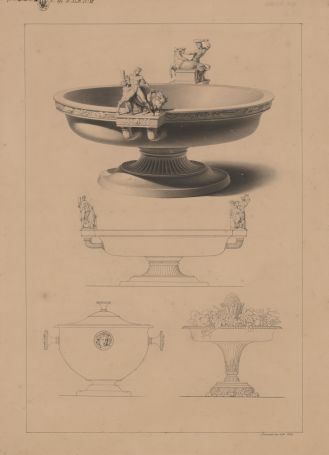 It is doubtful whether this was ever used. 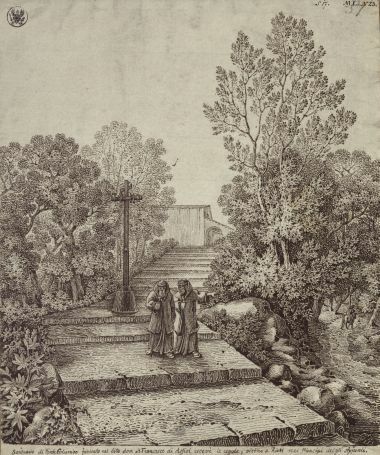 Luigi Cherubini's heroic three-act opera "Lodoiska", with a libretto by Charles Françoise Filette-Loraux, had been part of the Berlin repertoire since 1797 and was performed using an adaptation by Carl Alexander Herklots. 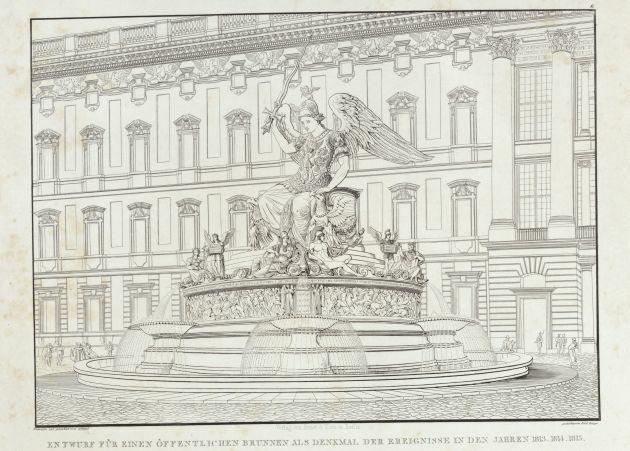 It was performed once more on 3rd August 1818, the birthday of Frederick William III. 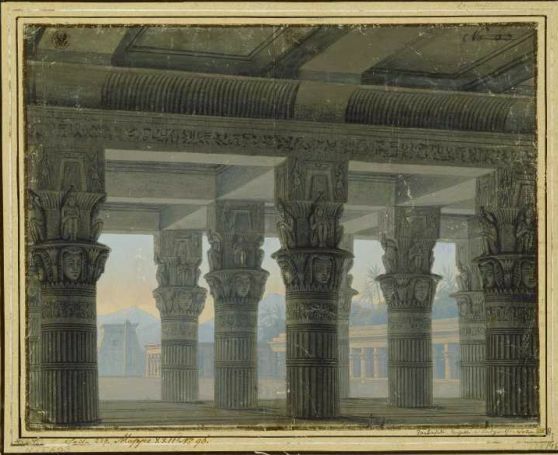 Schinkel probably only created one stage set for this performance, of which no visual record remains. 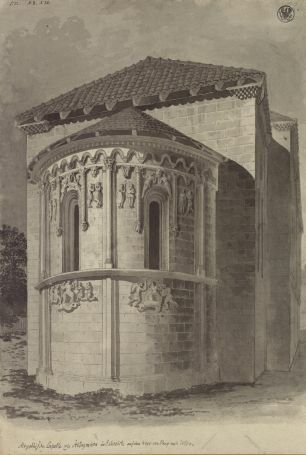 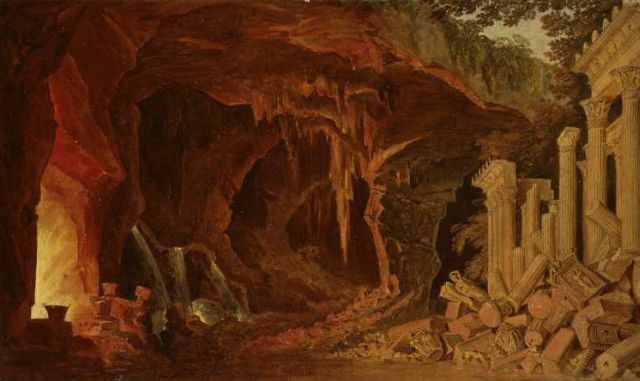 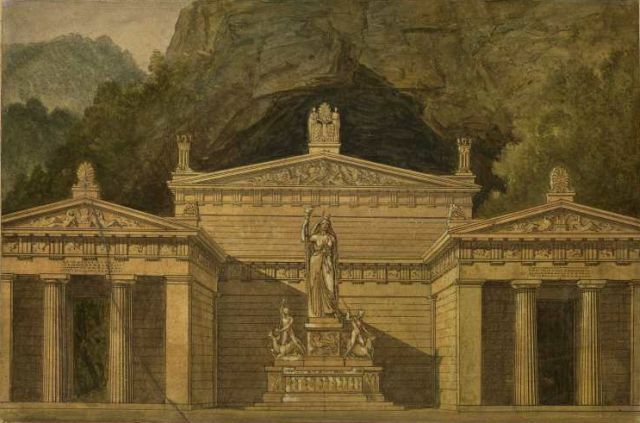 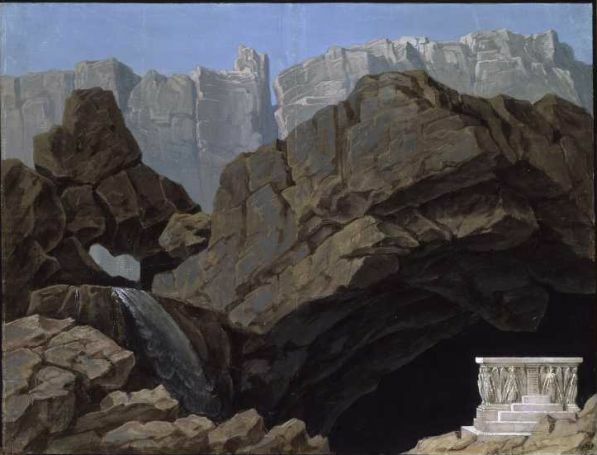 Schinkel provided three stage set designs for the reworking of what was probably Gaspare Spontini's greatest operatic success, the tragédie lyrique "La vestale" ("The Vestal Virgin") in 1818. 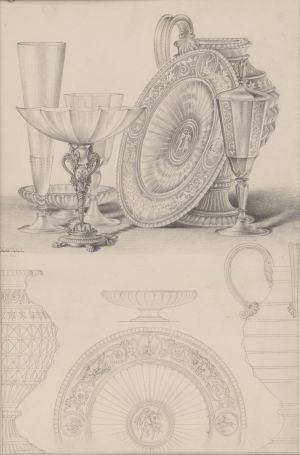 A fourth set was taken from the props collection. 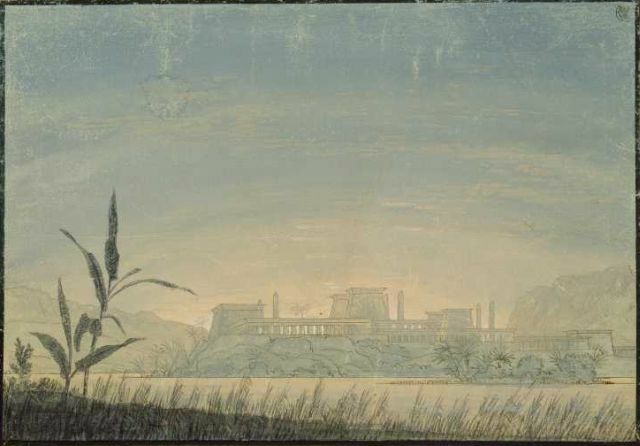 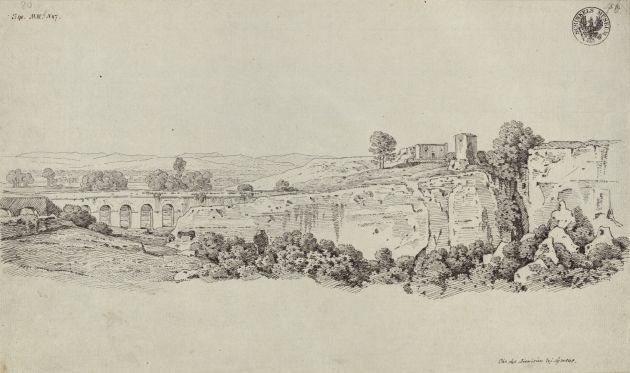 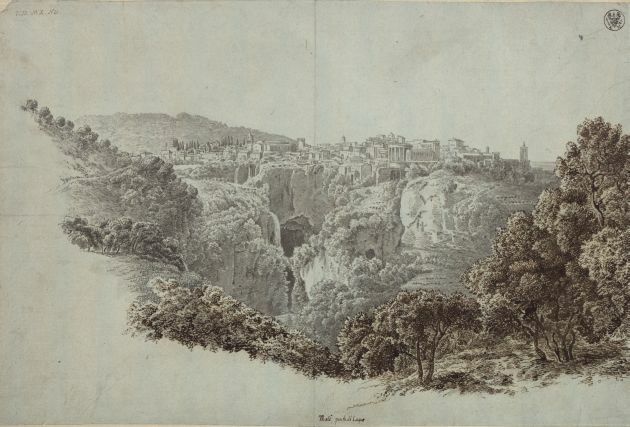 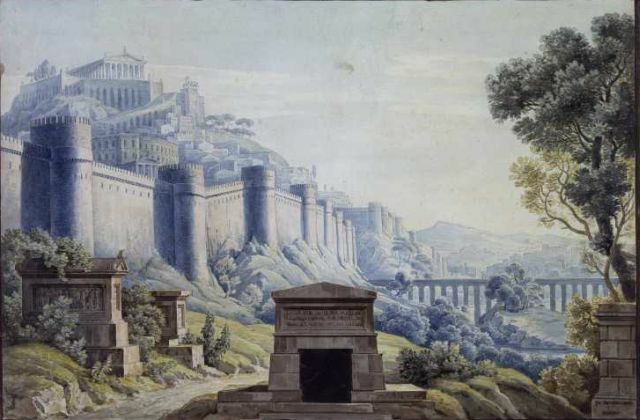 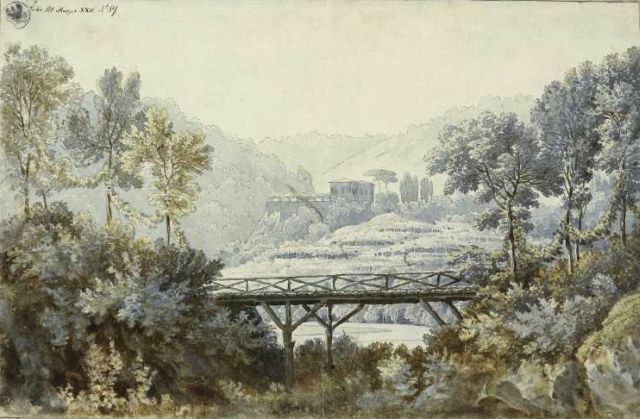 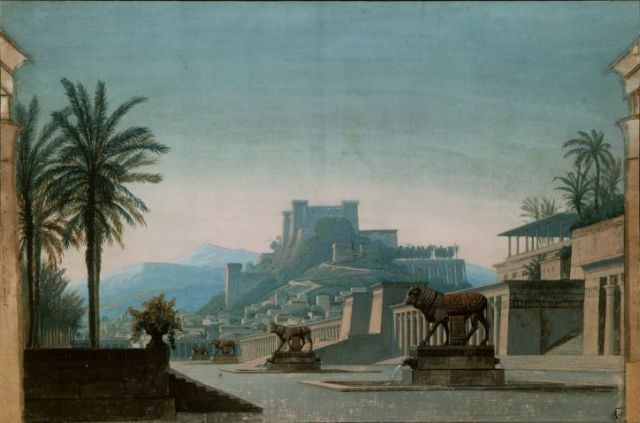 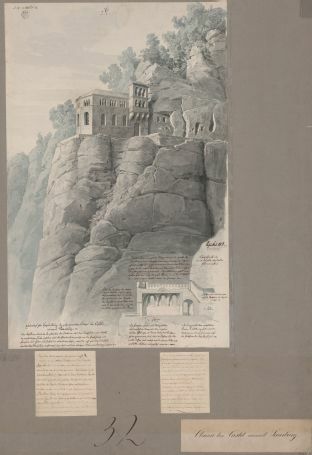 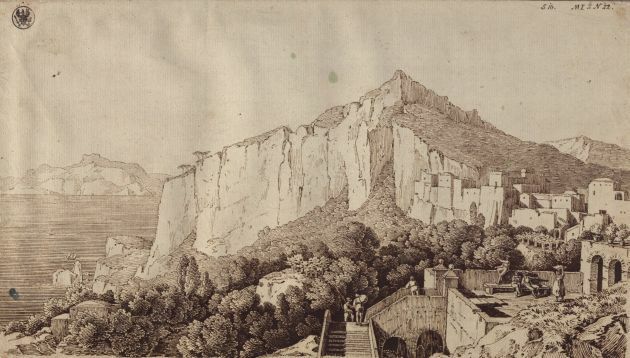 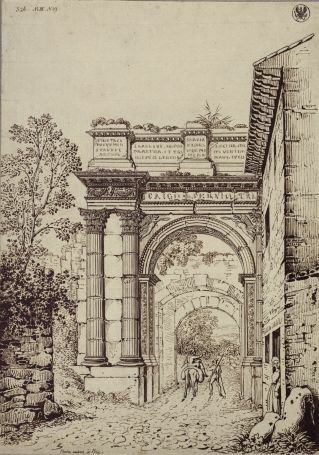 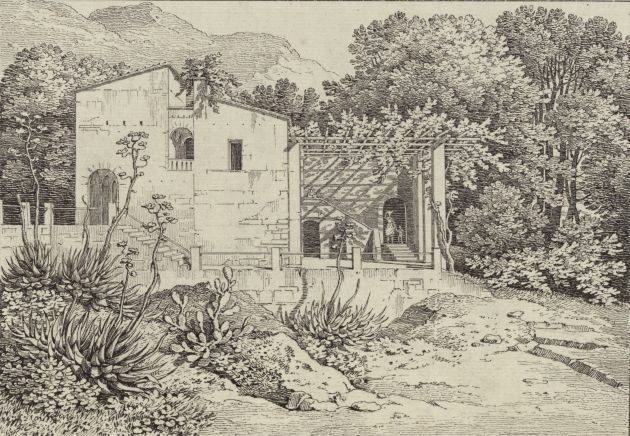 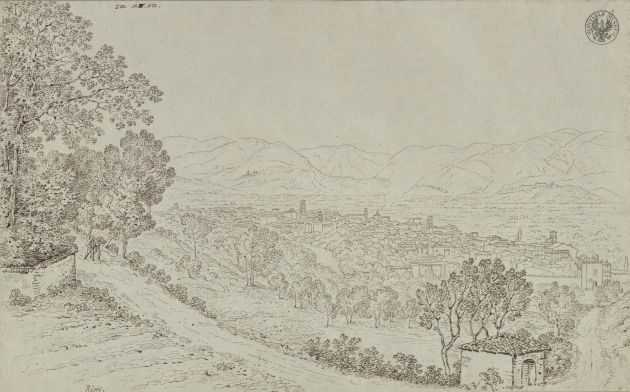 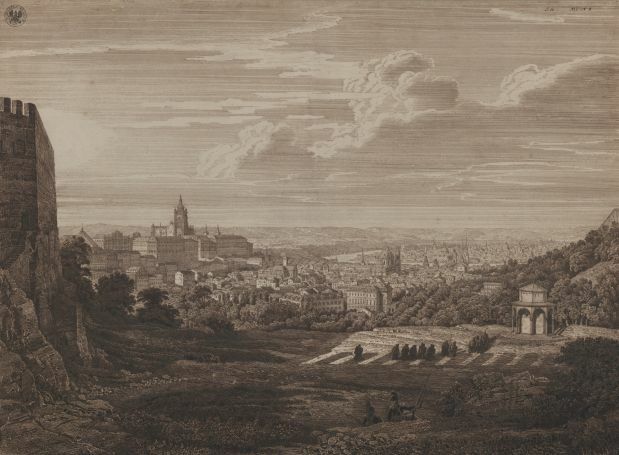 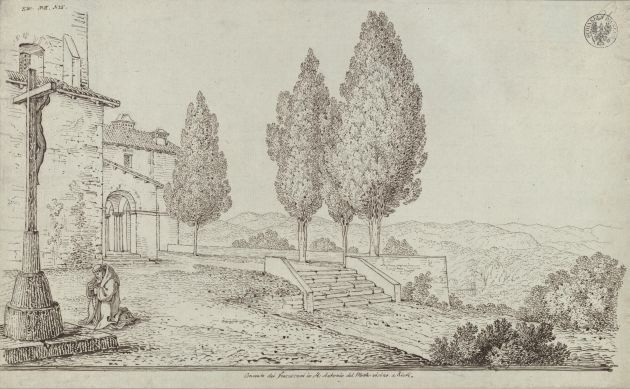 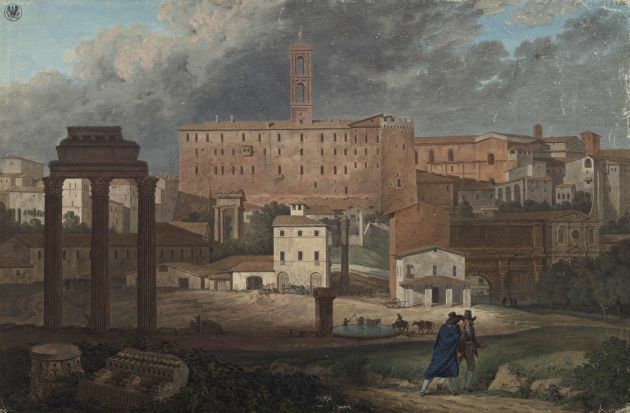 Schinkel created a total of five sets for the new productions of Gaspare Spontini's opera "Fernand Cortez" in 1818 and 1824, of which three have survived to this day. 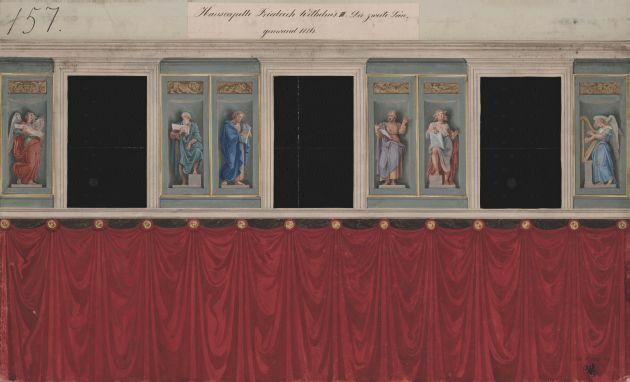 The designs for the third set (1818) and the fourth (1824), which became necessary after Spontini re-worked the third act, are missing, and no visual records remain. 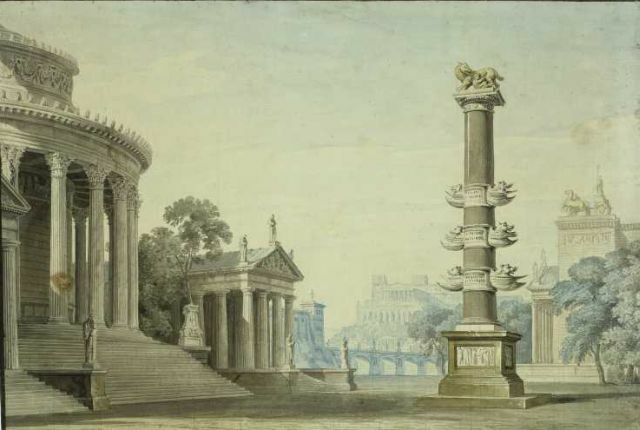 After Frederick William III watched Spontini's great operas in Paris in 1814, particularly "La vestale", the performance of "Fernand Cortez" resulted in the latter's appointment to the post of General Musical Director at Berlin's Court Opera. 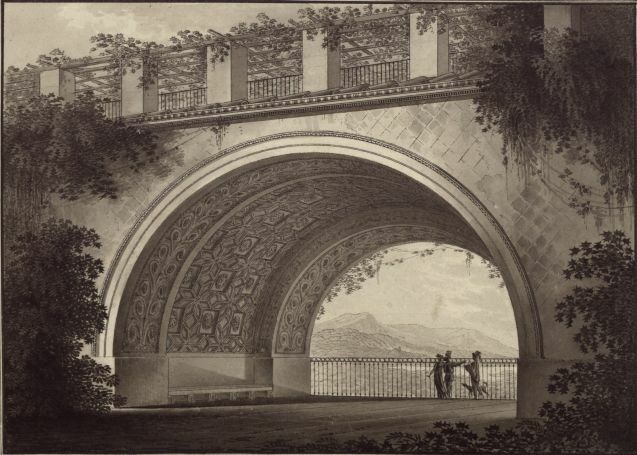 Schinkel created four designs for the new production of Schiller's "Don Carlos" on 6th January 1819, of which two have survived. 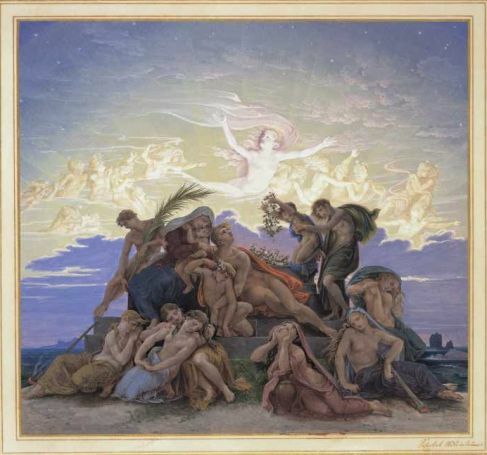 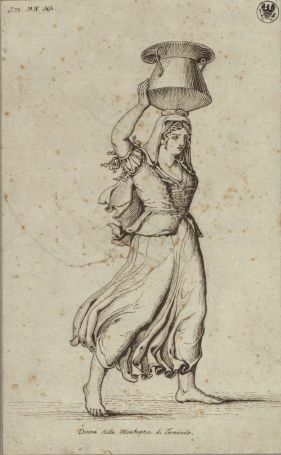 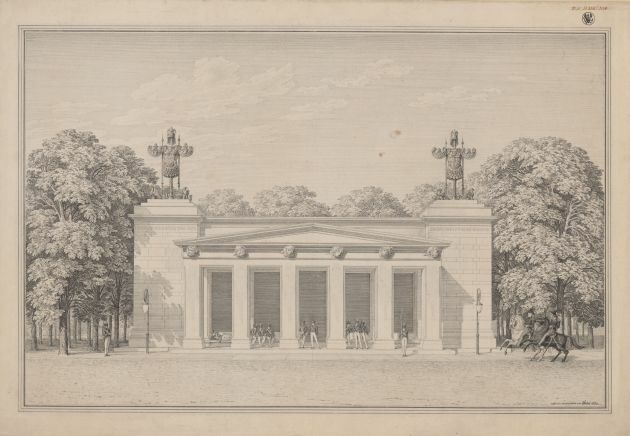 Schinkel created five designs for the Berlin premiere of Kotzebue's play "Herrmann and Thusnelda" on 29th March 1819, of which three have survived. 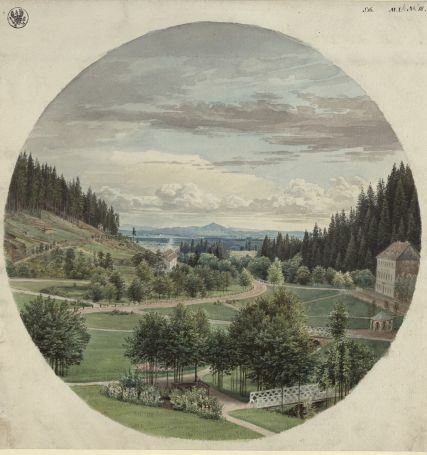 Less than a week before the performance, Kotzebue, who had a reputation for being conservative and reactionary, was murdered by radical Jena student Karl Ludwig Sand. 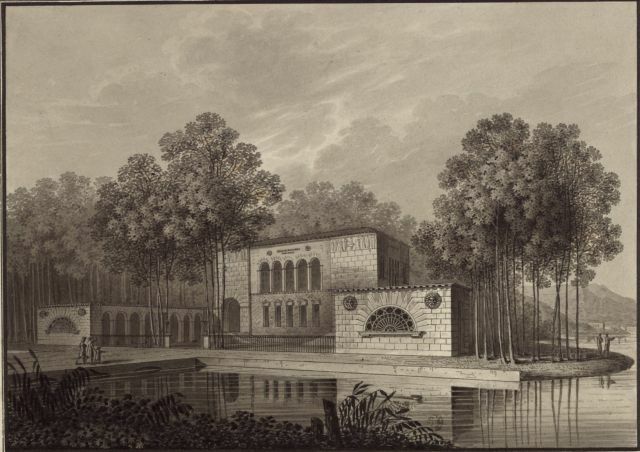 In the light of these events, the performance of "Herrmann and Thusnelda" was met with displeasure by Berlin's liberal circles. 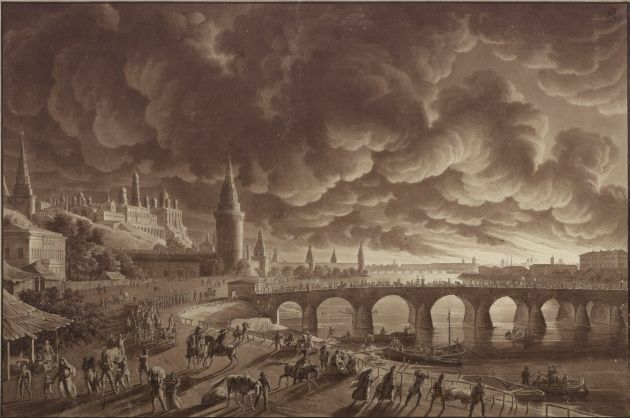 Schiller's tragedy was performed in Berlin in June 1803, shortly after its Weimar premiere, and proved extremely popular. 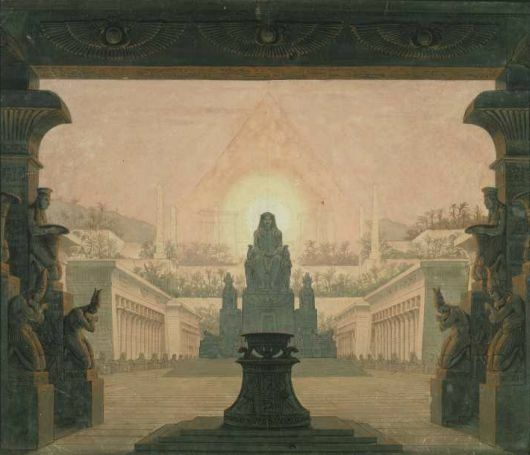 Schinkel created a new stage set for the performance on 14th May 1819, which was used in the first and last scenes. 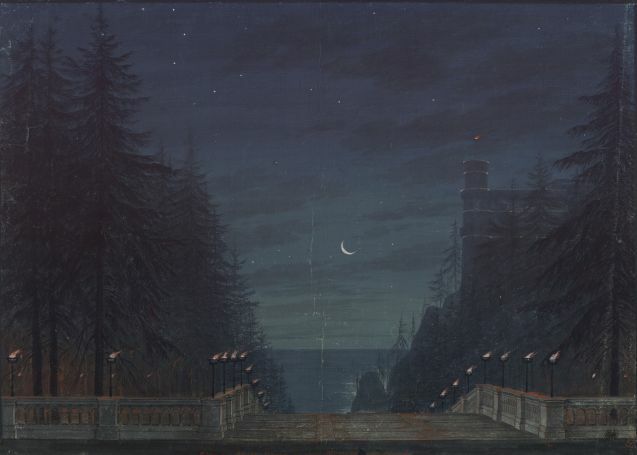 Schinkel created three designs for the premiere of Jakob Andreas Konrad Levezow's play "Ratibor and Wanda". 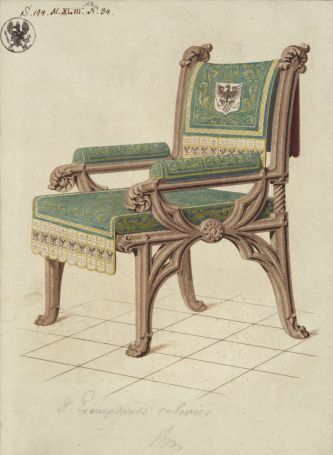 A further design was submitted by Wilhelm Gropius, while a fourth set was taken from the props collection. 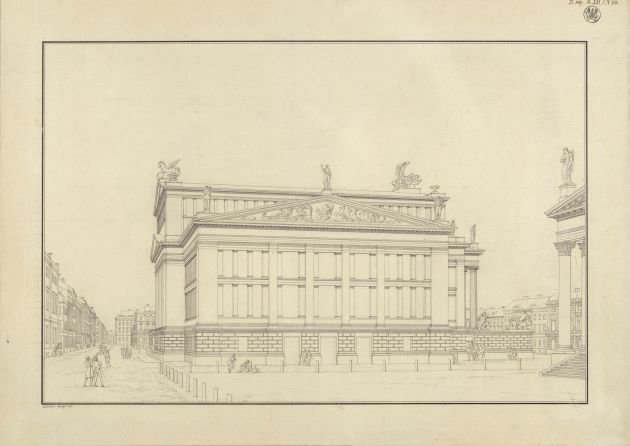 Levezow was a Berlin-based antiquarian and connoisseur of classical as well as local antiquities. 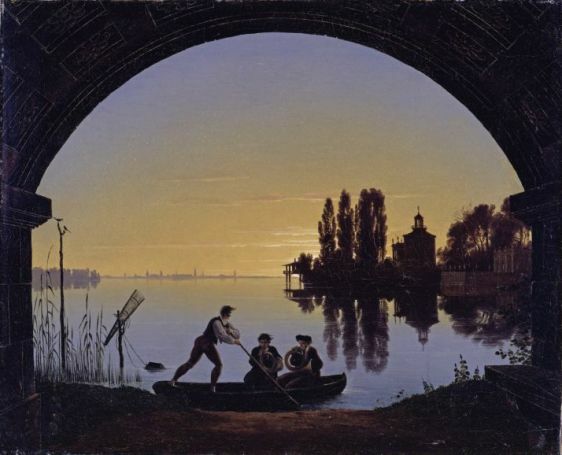 He was also an occasional poet and, as in the case of "Ratibor and Wanda", a playwright. 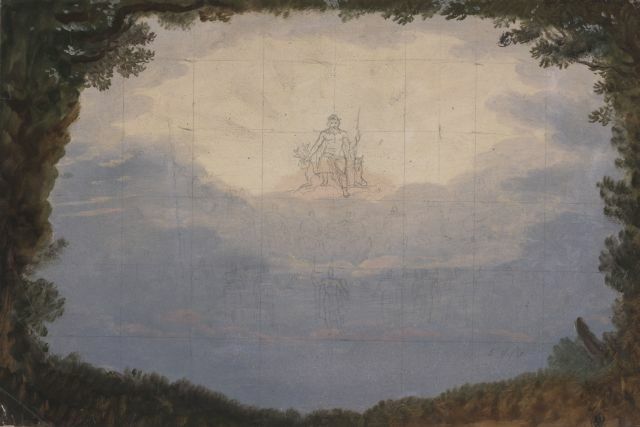 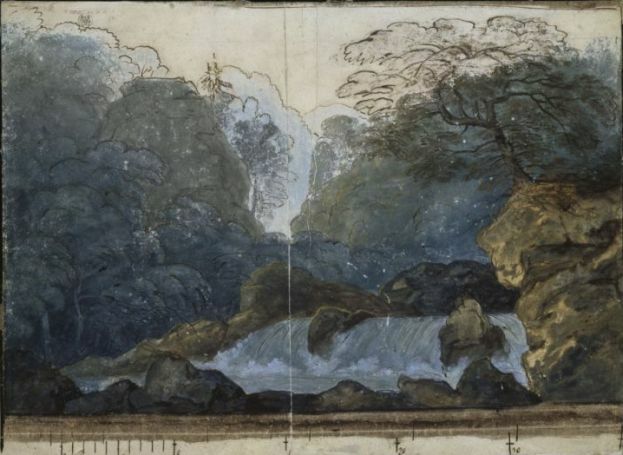 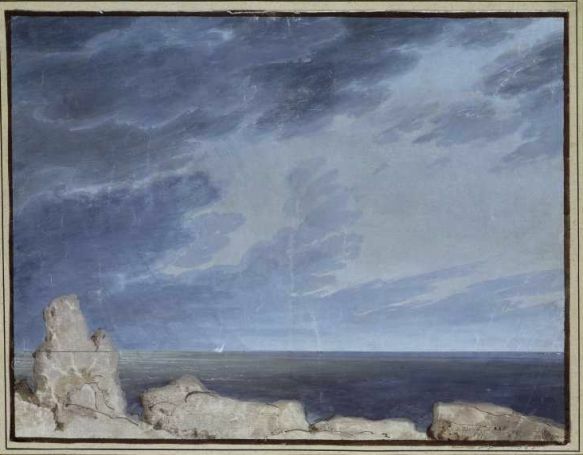 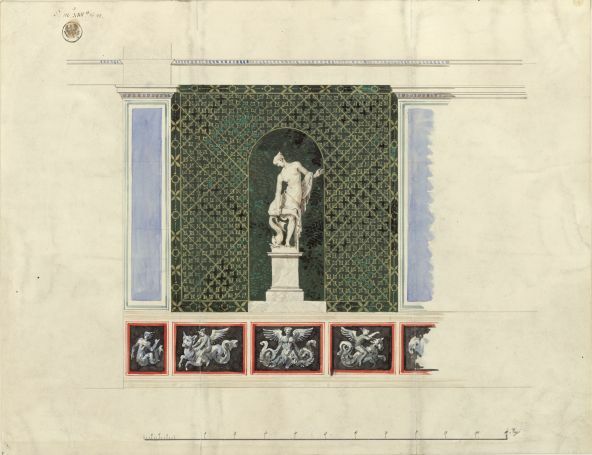 Schinkel created four designs for the new production of Christoph Willibald Gluck's "Armide", three for stage settings and one for a backdrop arch. 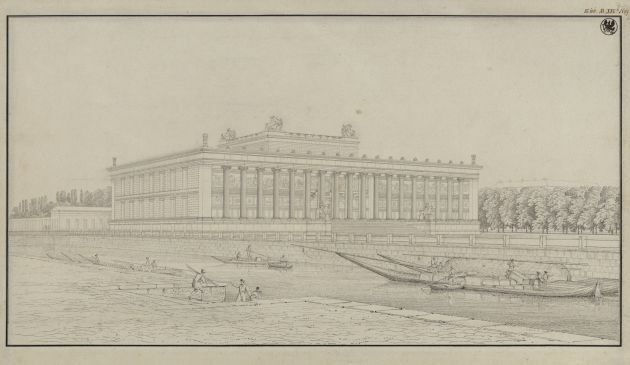 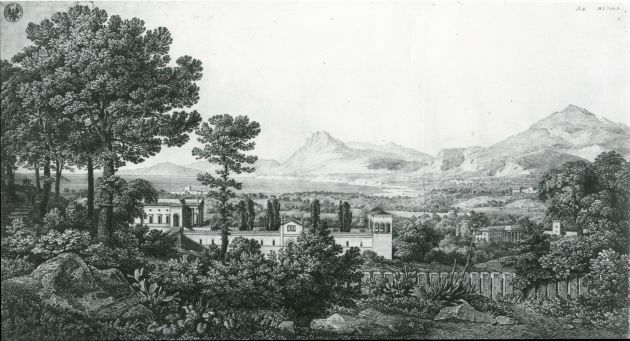 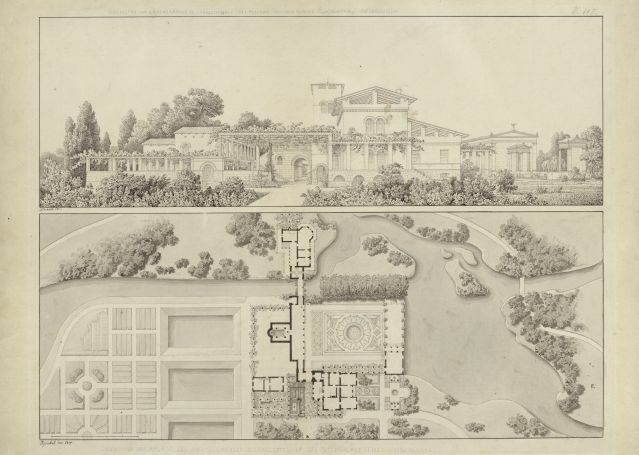 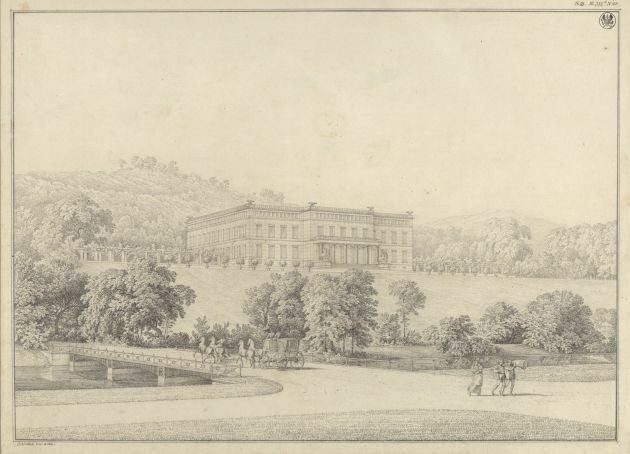 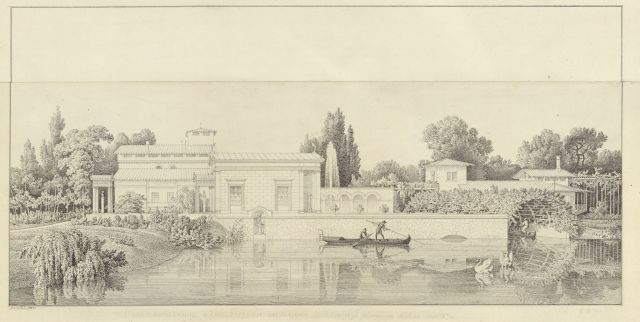 The "South Horizon", assigned by Alfred von Wolzogen to "Armide" in the Schinkel Museum catalogue, was probably built as early as 1816. 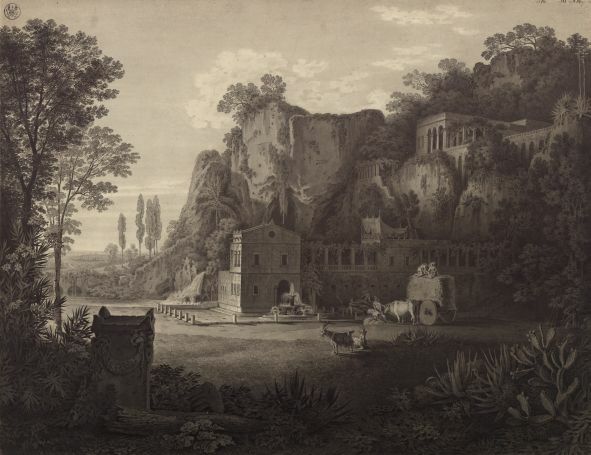 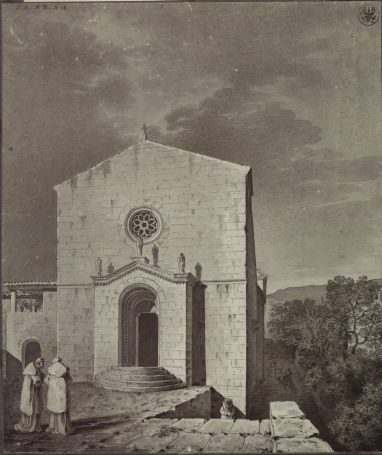 The set's extremely generalised geography allowed it to be used in various productions, probably including the new production of Gluck's "Armide" in 1820. 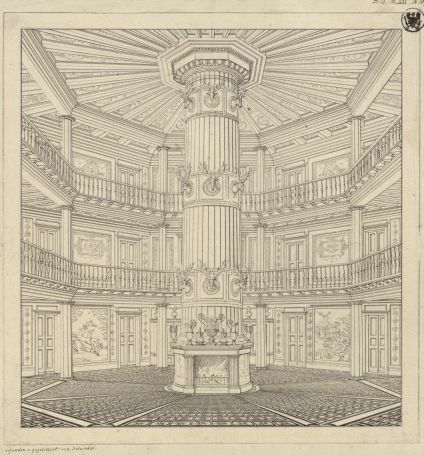 Several scenes from Goethe's "Faust, Part One", including both “study scenes” and some “Gretchen scenes”, were performed on 24th May 1820 in the theatre hall at Monbijou Palace. 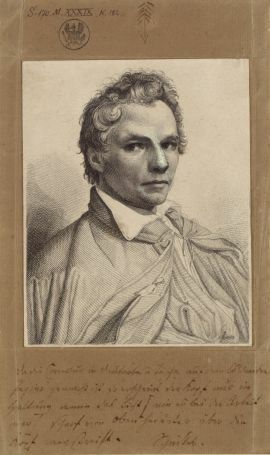 Prince Anton von Radziwill, who had composed scores for "Faust" as early as 1811 and presented these to Goethe in 1814, instigated the performance. 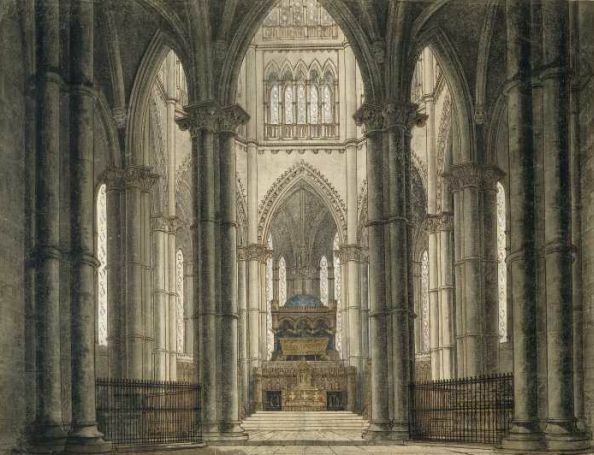 This took place in the presence of the King and part of the court, and was repeated on 7th June in honour of the arrival of Berlin's new General Musical Director. 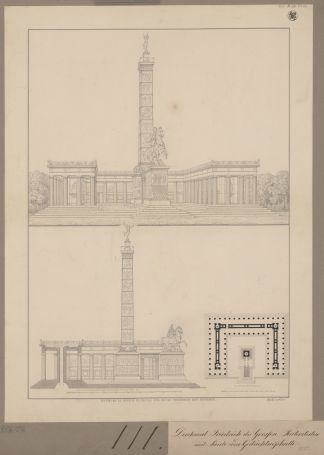 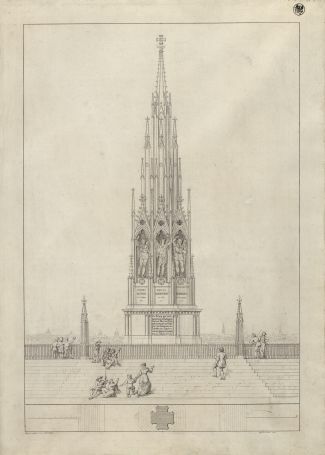 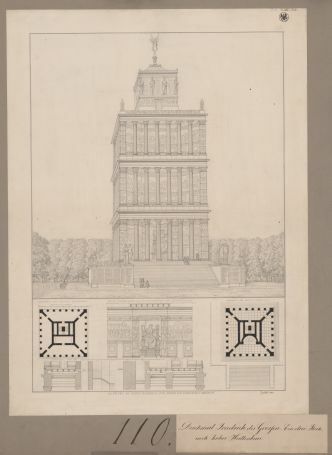 Schinkel created two designs for Ernst Raupach's tragedy "The Princes Chawansky", the one on display and another for the Princes' mausoleum. 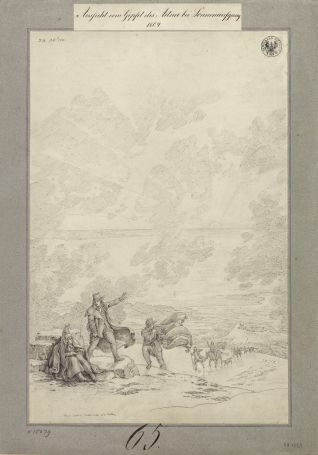 The play did not meet with great success. 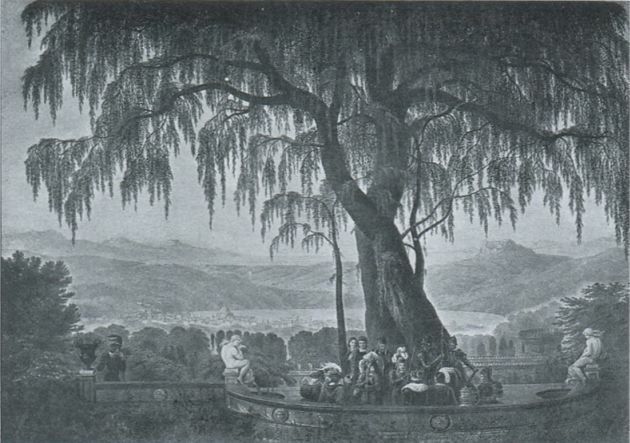 It premiered in Vienna in 1819 and was probably only repeated in Berlin, where it was performed 11 times until 1832. 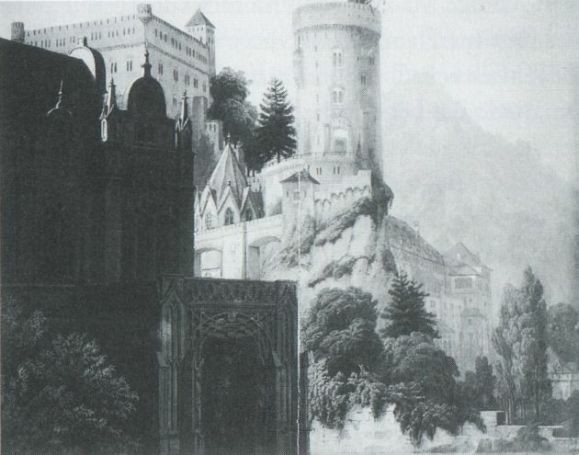 Henri Montan Berton's opera "Aline, Queen of Golkonda" had long been part of the Berlin repertoire. 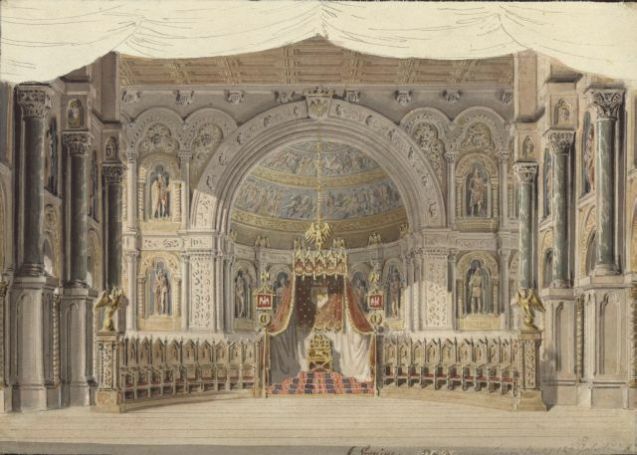 A new production was staged as part of the birthday celebrations for Frederick William III on 3rd August 1820. 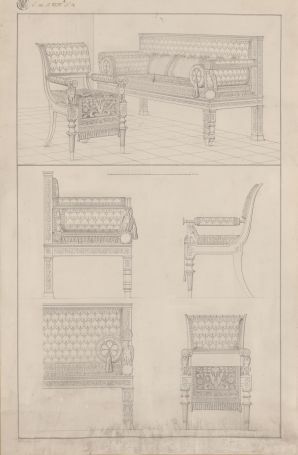 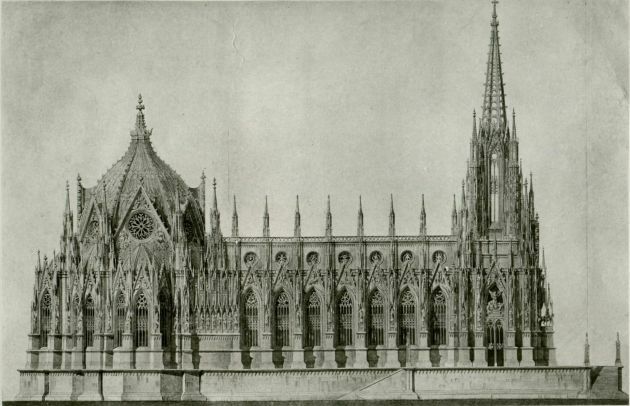 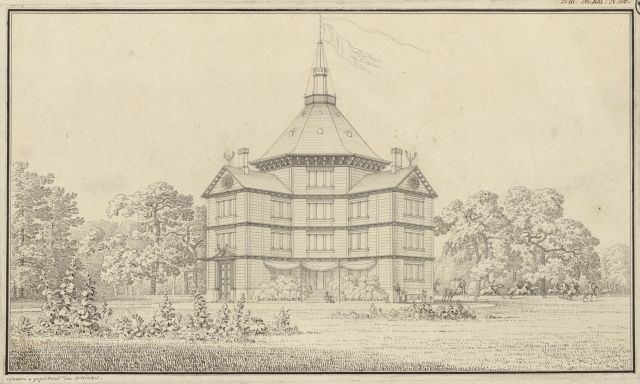 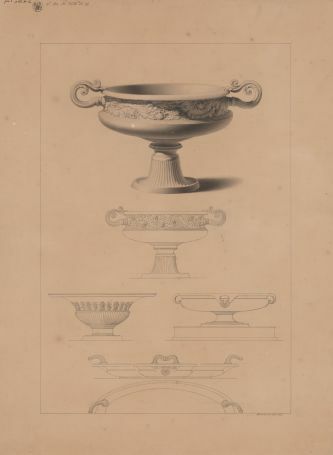 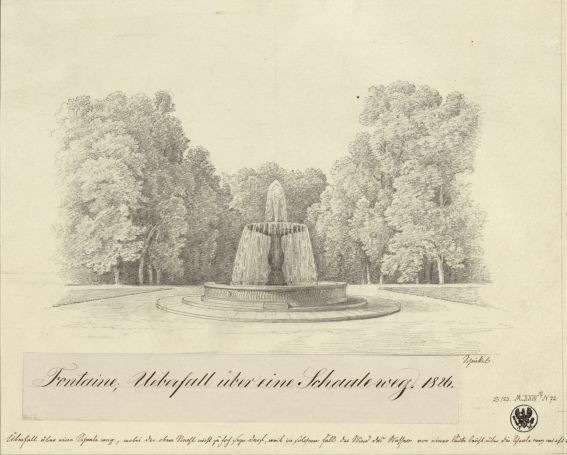 Schinkel created a design for the occasion, but there is no record of its use. 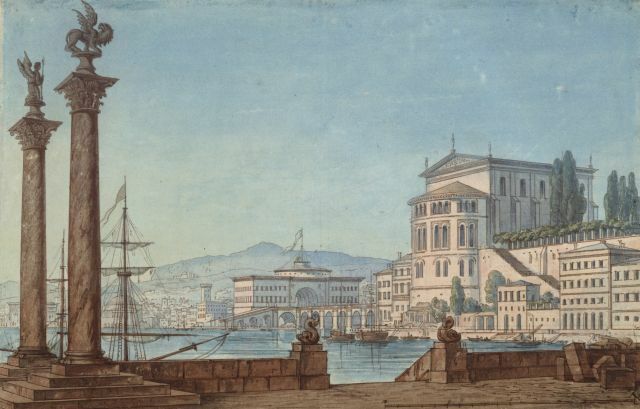 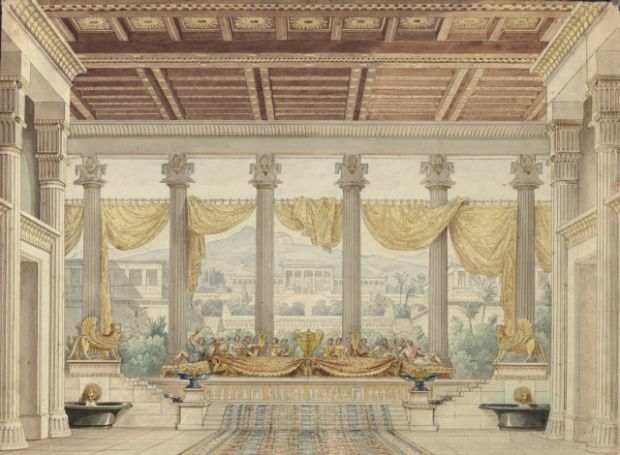 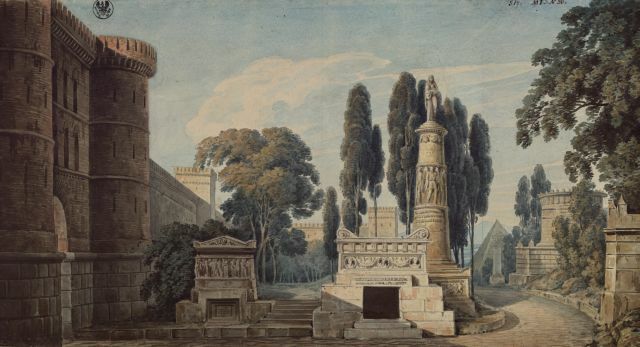 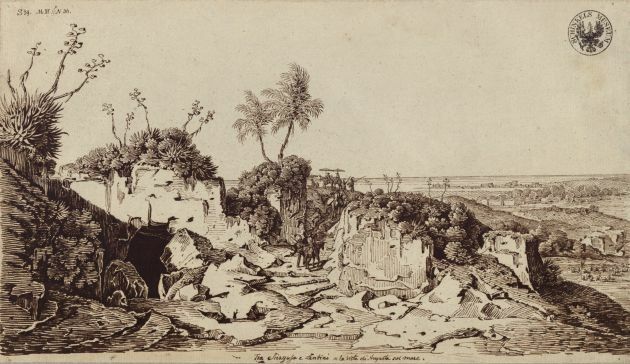 Schinkel probably created designs for all five stage sets used in the premiere of Gaspare Spontini's opera "Olimpie" on 14th May 1821, completing the work between September 1820 and May 1821. 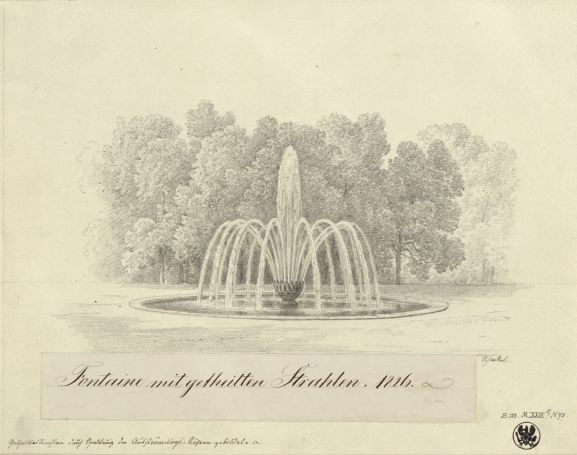 Both this, and Frederick William III's repeated attendance at rehearsals, exemplifies the importance attached to opera in Berlin at that time. 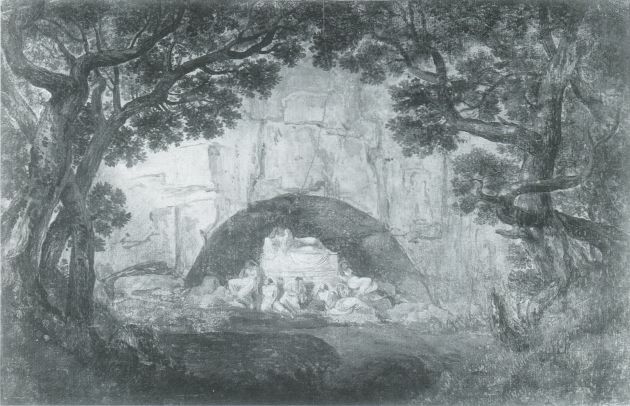 The opera was sung in German, as was usual for the period. 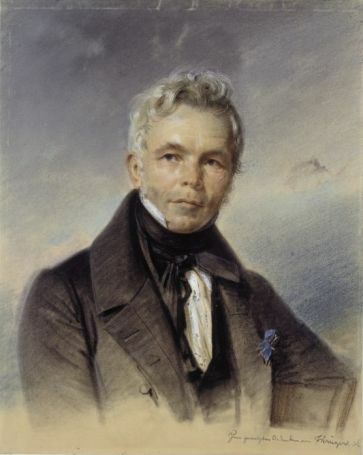 E. T. A. Hoffmann was responsible for the translation of the French text. 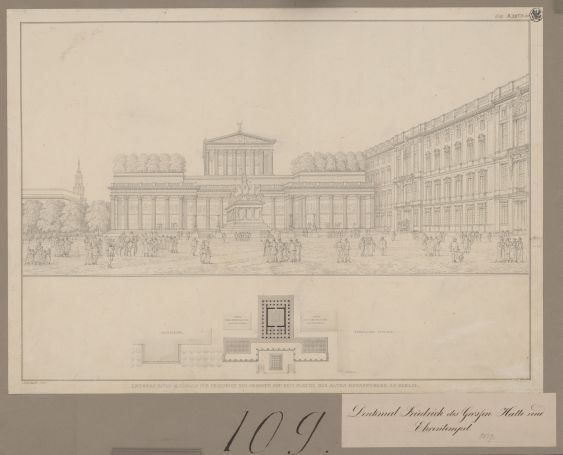 The opening of Schinkel's Playhouse in Berlin's Gendarmenmarkt square was celebrated with a ballet and a scene from Goethe's "Iphigenia in Tauris" on 26th May 1821. 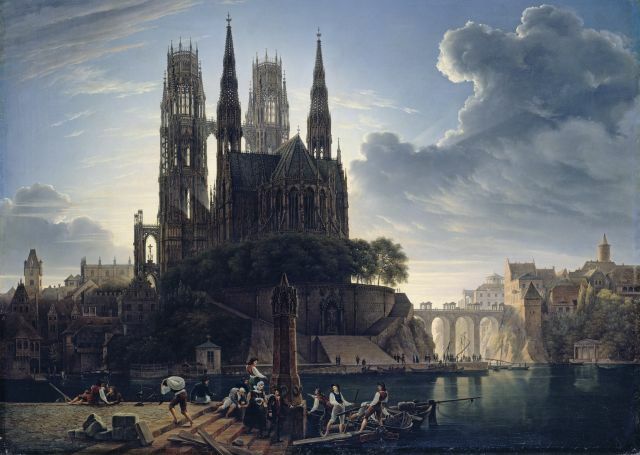 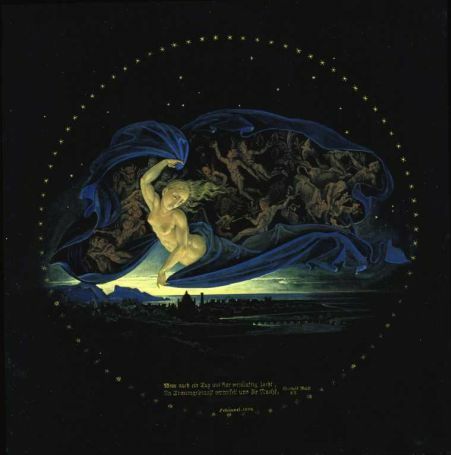 The performance was preceded by a prologue composed by Goethe especially for the occasion, which was delivered in front of Schinkel's famous backdrop with a view of the Playhouse, between the domes of the German and French Cathedrals. 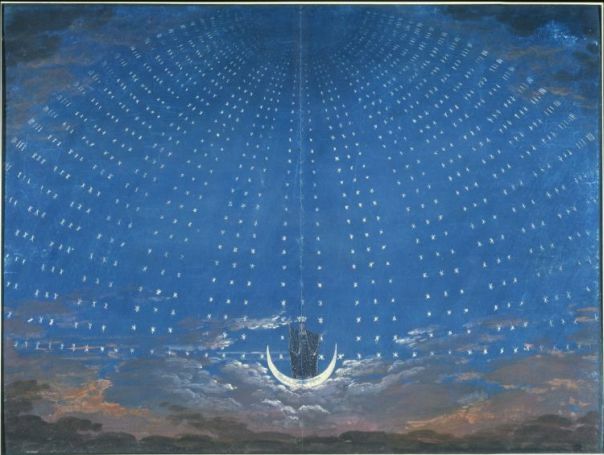 It was followed by a scene from Goethe's play, for which Schinkel created the stage designs, and the ballet. 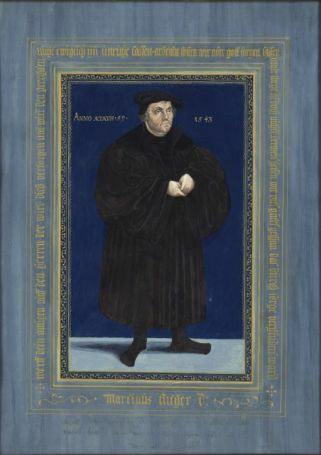 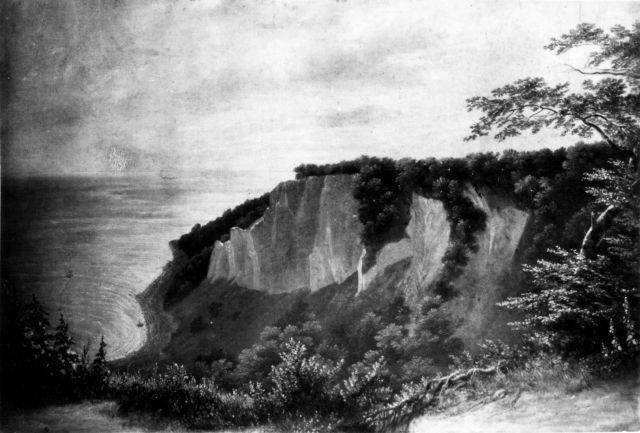 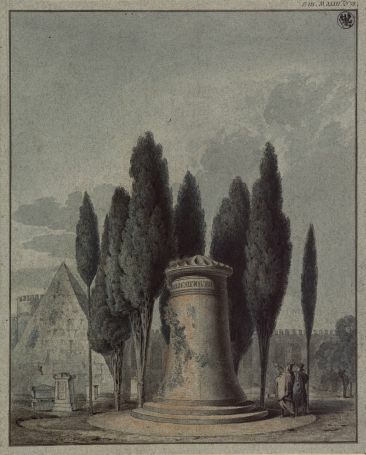 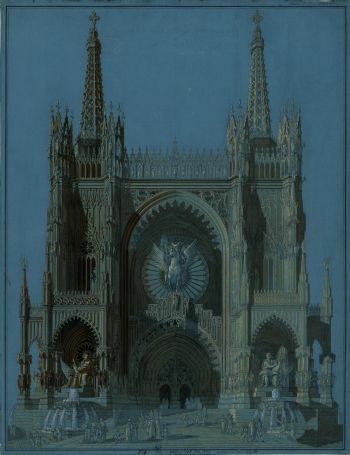 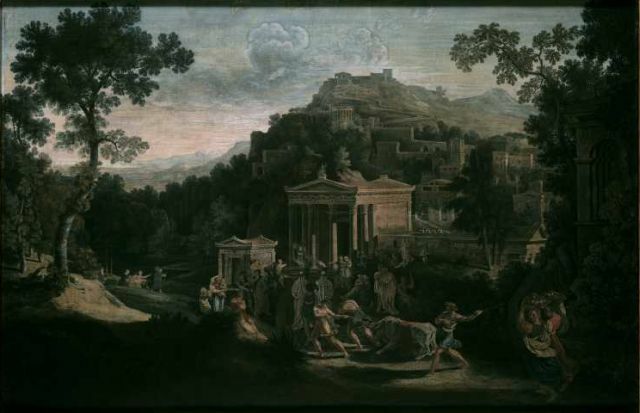 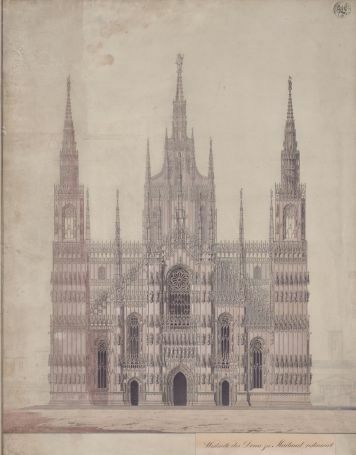 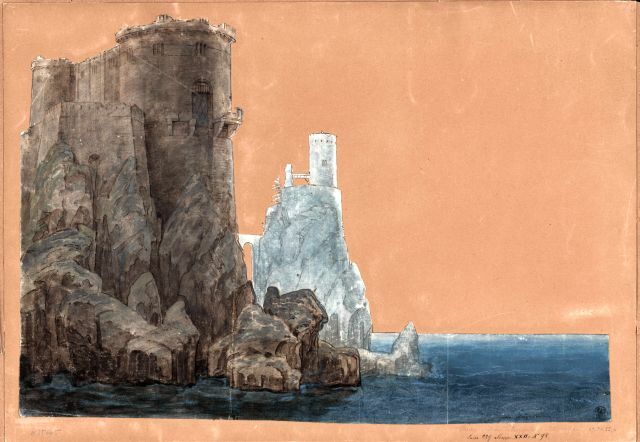 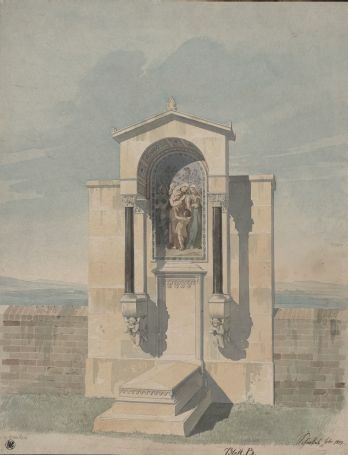 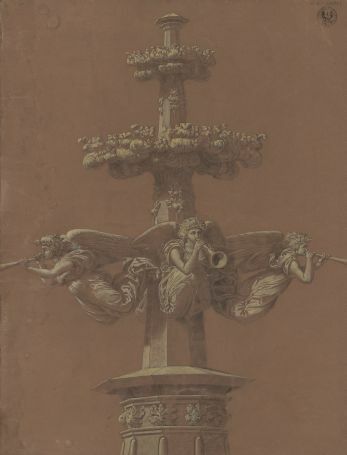 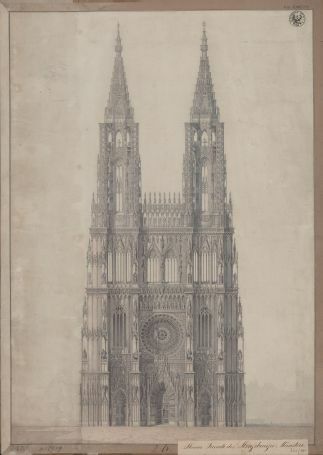 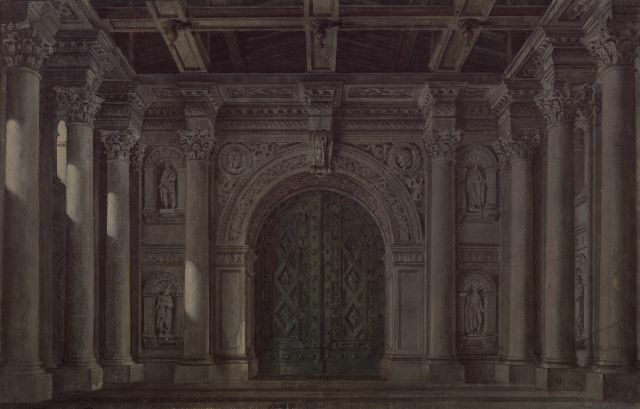 According to Wolzogen, this design for a stage backdrop was intended for general use and created without concrete references to a particular work. 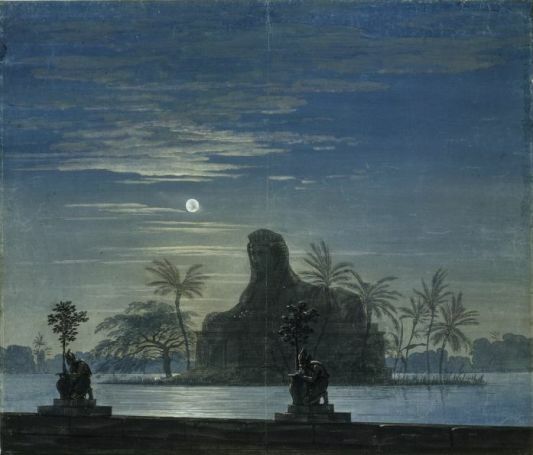 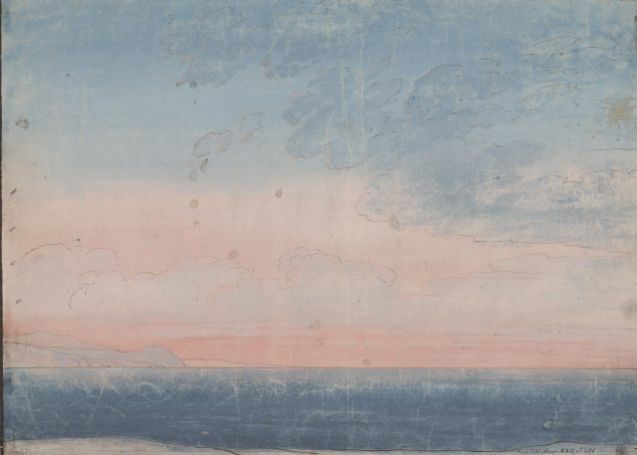 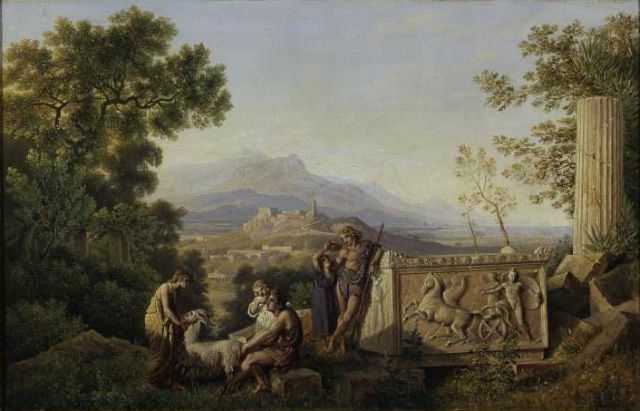 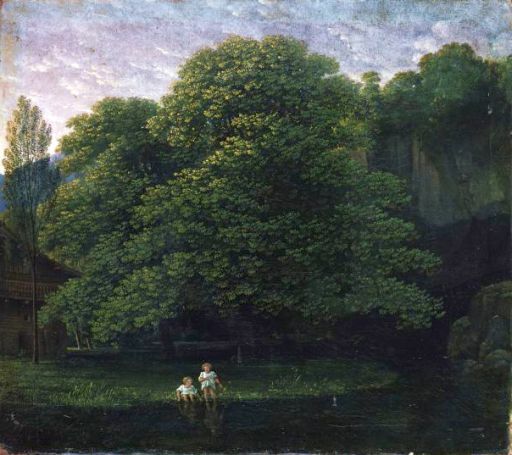 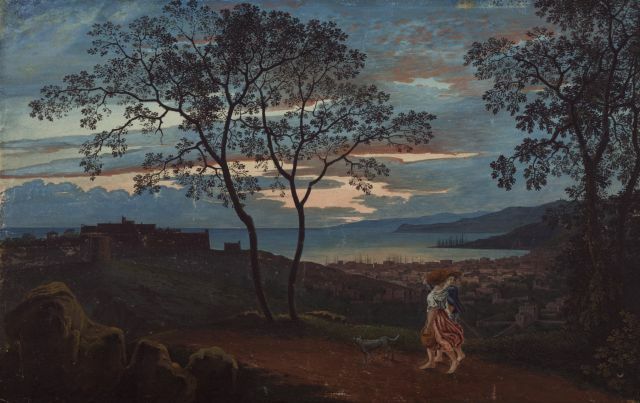 This was usual theatrical practice and probably also applies to the "South Horizon" set, which Wolzogen allocated to Gluck's "Armide" in the Schinkel Museum's catalogue. 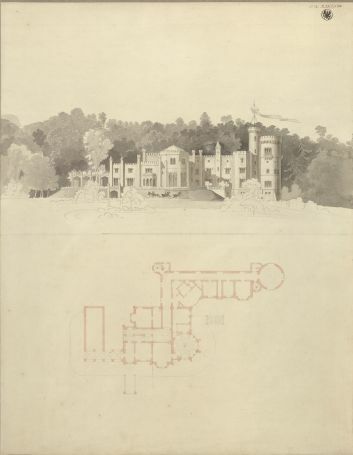 However, the present design may well refer to a specific setting. 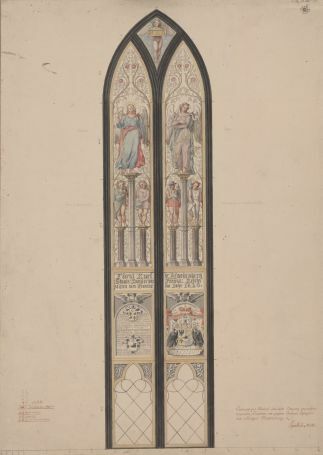 The two columns showing Saints Mark (represented by his symbolic animal) and Theodore, the patron saints of Venice, point to Giacomo Rossini's opera "Othello, the Moor of Venice", which premiered in Berlin on 16th January 1821. 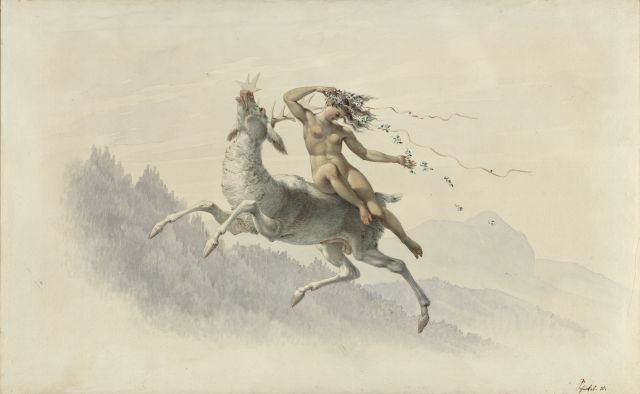 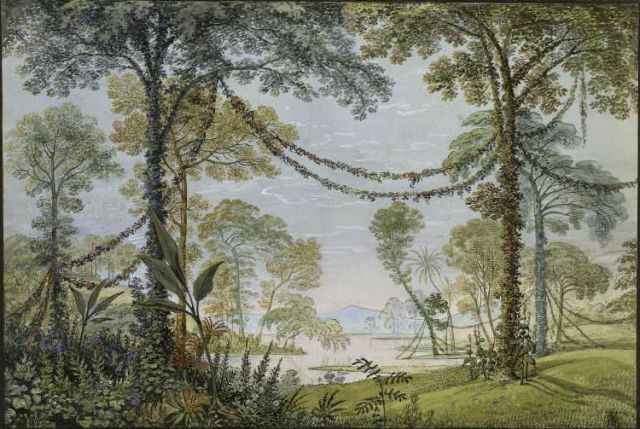 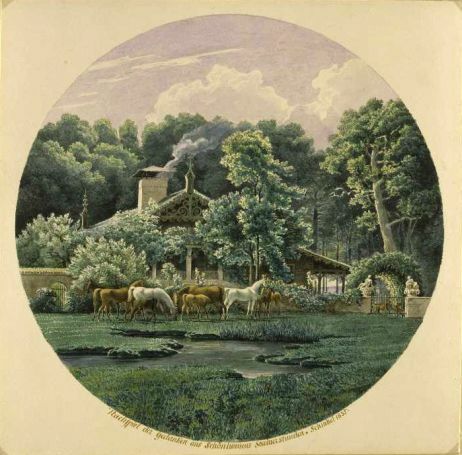 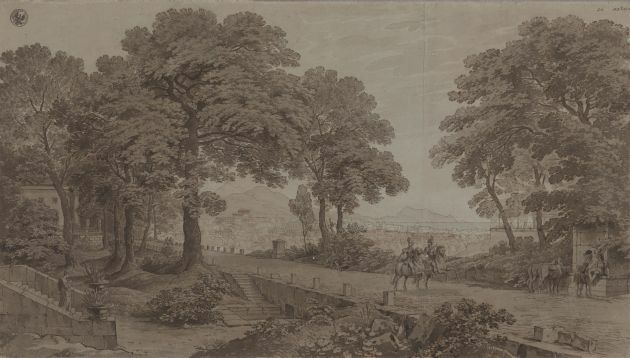 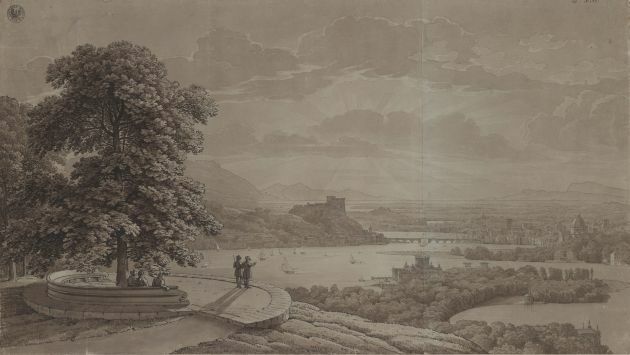 Schinkel created three designs for two stage sets for the premiere of Georg Abraham Schneider's romantic opera "Aucassin and Ricolette", with a libretto by Johann Ferdinand Koreff, on 26th February 1822. 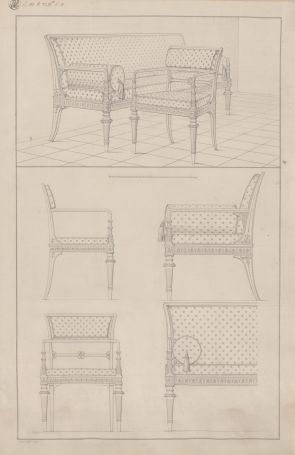 Only the design for the fifth set has survived. 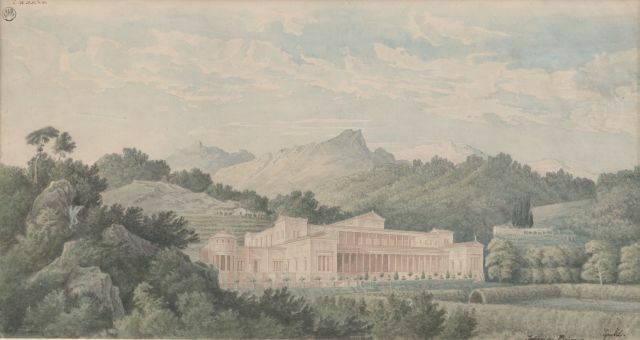 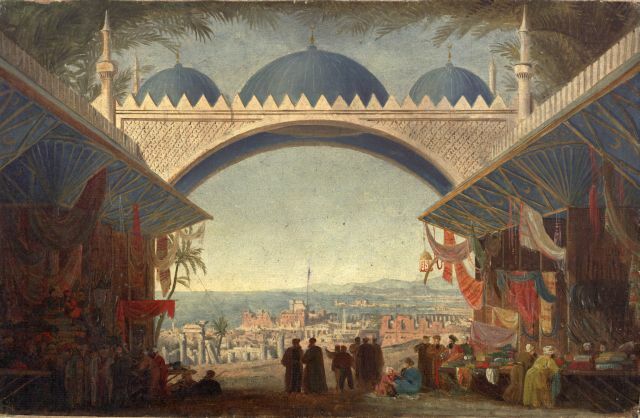 The premiere of Gaspare Spontini's opera "Nurmahal or the Rose Festival of Kashmir" took place on the occasion of the wedding between Princess Alexandrine of Prussia and Hereditary Grand Duke Paul Frederick of Mecklenburg-Schwerin on 27th May 1822. 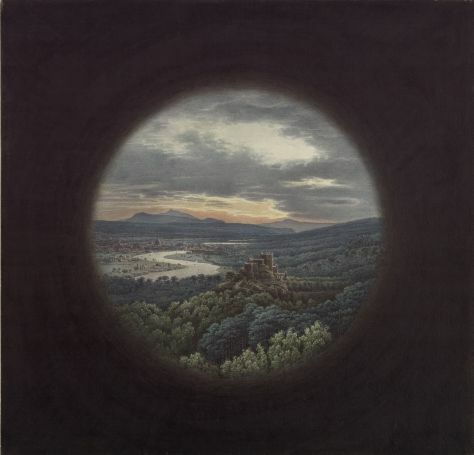 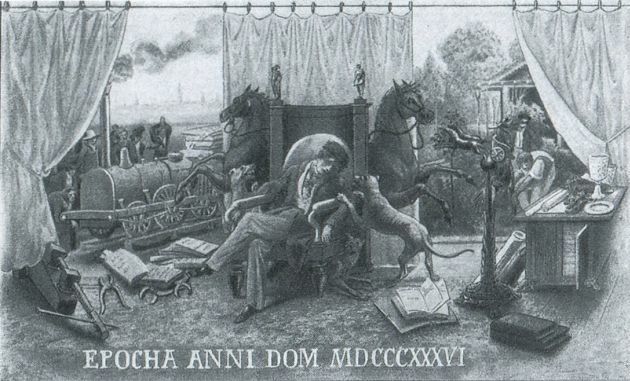 The story, based on Thomas Moore's epic poem "Lalla Rookh", proved extremely popular at the Prussian court, having already formed the theme for a court party the previous year. 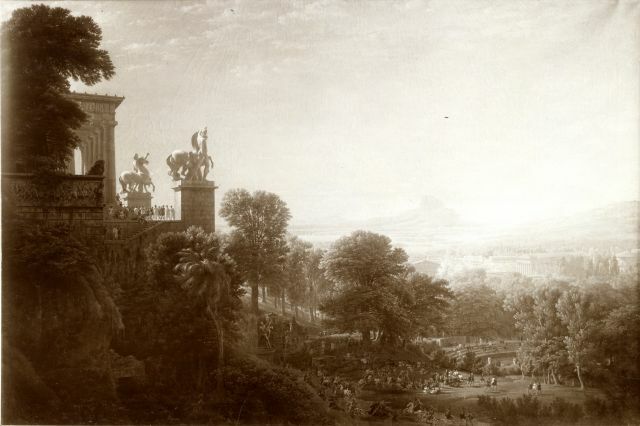 Spontini also composed the music accompanying the party, held in the State Rooms of the Berlin palace, while Schinkel arranged the tableaux vivants. 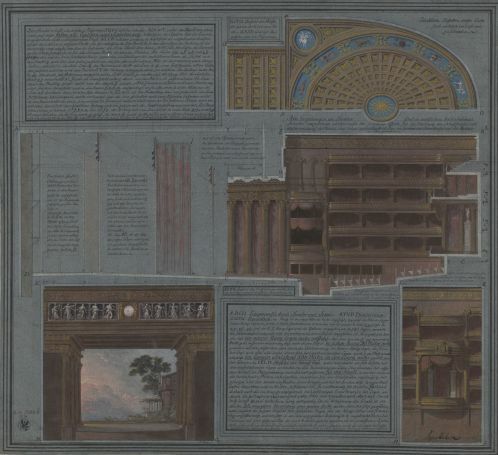 Schinkel designed all four stage sets for the 1822 opera. 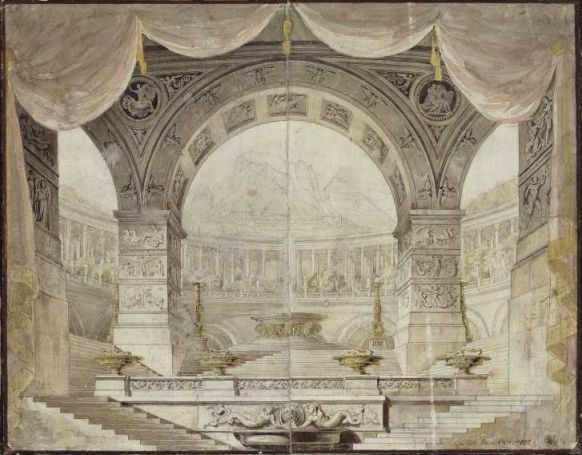 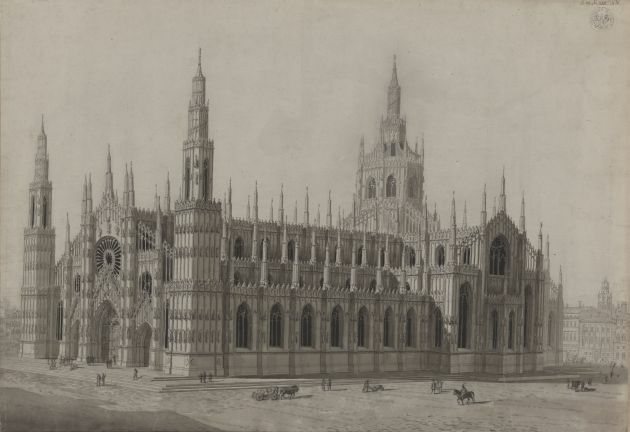 Schinkel created four designs for three stage sets for the premiere of Gaspare Spontini's magical opera "Alcidor" on 23rd May 1825, on the occasion of the wedding between Louise, the youngest daughter of Frederick William III, and Prince Frederick of the Netherlands. 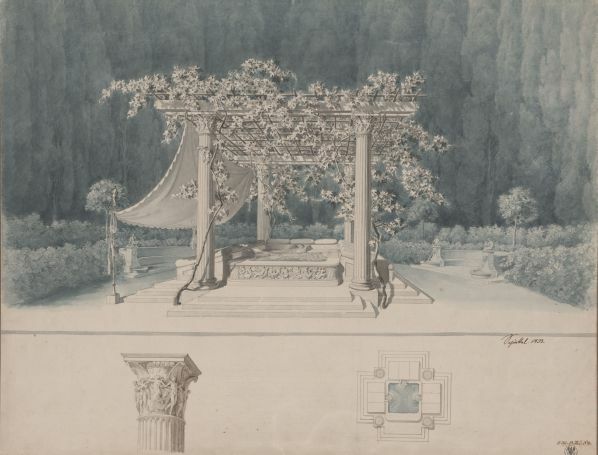 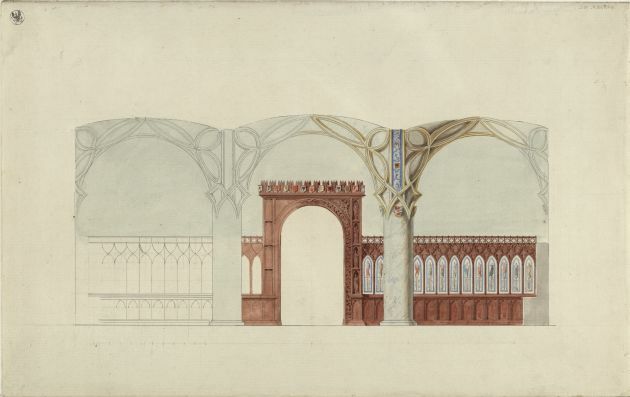 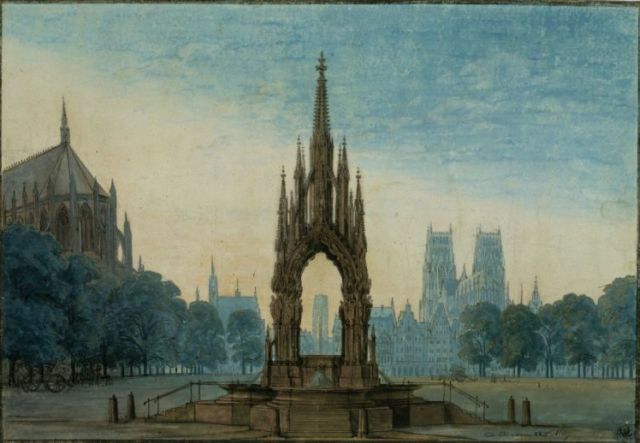 These were supplemented by five other stage sets, designed and built by Wilhelm Gropius and theatre painters Johann Karl Jakob Gerst and Friedrich Wilhelm Köhler. 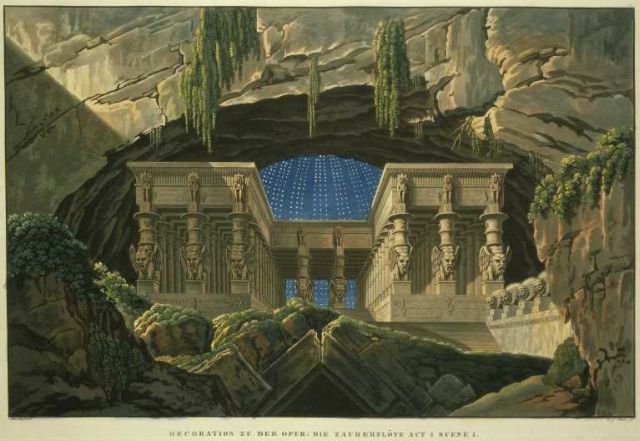 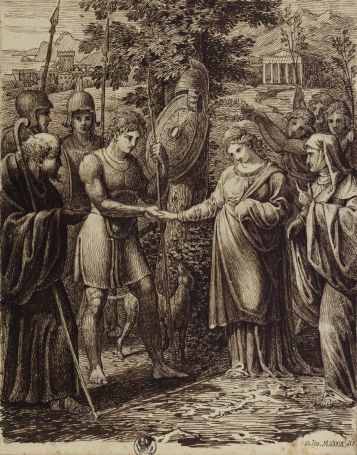 According to the play bill, Schinkel created all stage designs for Friedrich von Uechtritz' tragedy "Alexander and Darius". 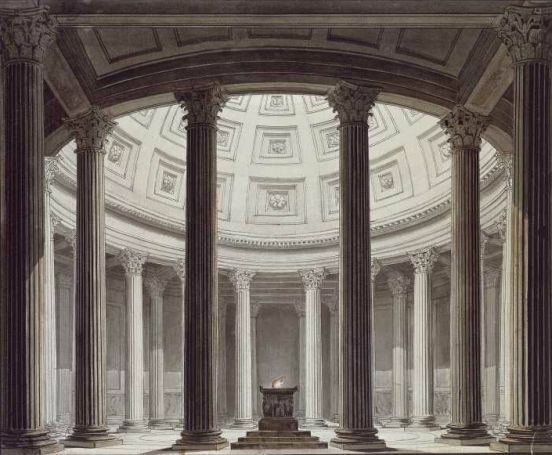 However, because only one known design exists, the accuracy of this information must be questioned. 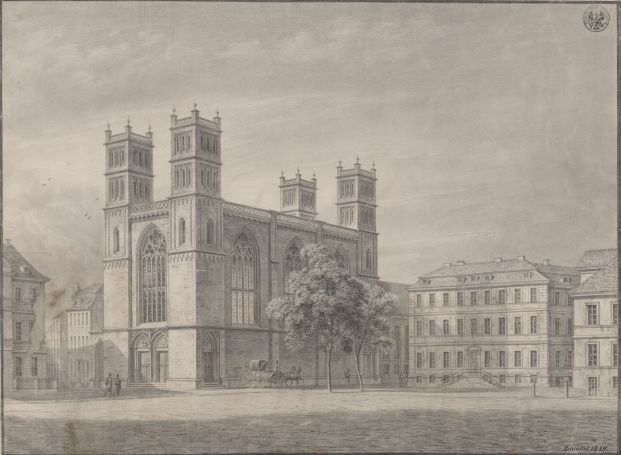 The premiere took place on 3rd March 1826, and was followed by just three further performances until 1830. 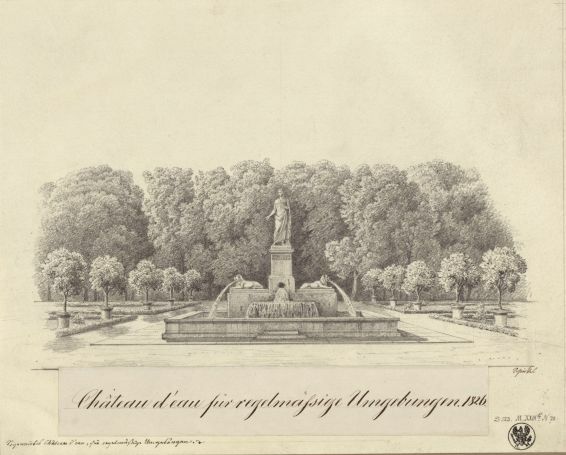 The premiere of the first act of Gaspare Spontini's opera "Agnes von Hohenstaufen" took place in 1827 on the occasion of the wedding between Prince Charles of Prussia and Princess Marie of Saxe-Weimar, while the complete, three-act opera was performed two years later during the wedding celebrations of Crown Prince William of Prussia (later Wilhelm I, German Emperor) and Augusta, the younger sister of Marie of Saxe-Weimar. 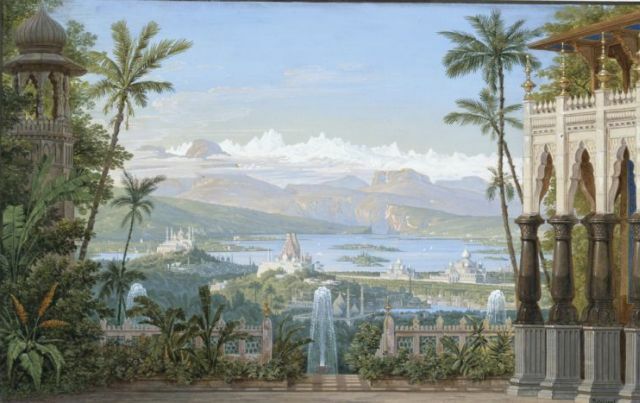 Schinkel created the designs for the first three sets and the seventh set in 1827, and those for the fifth and sixth sets in 1829. 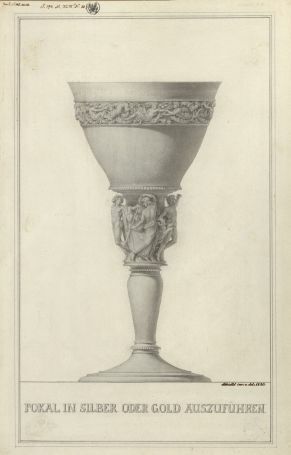 The fourth was taken from the props collection. 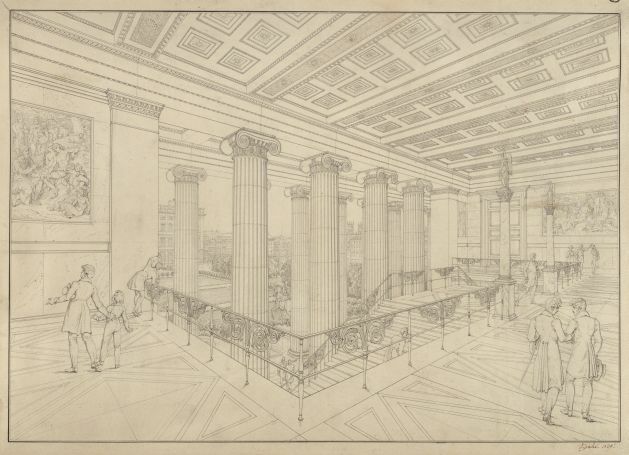 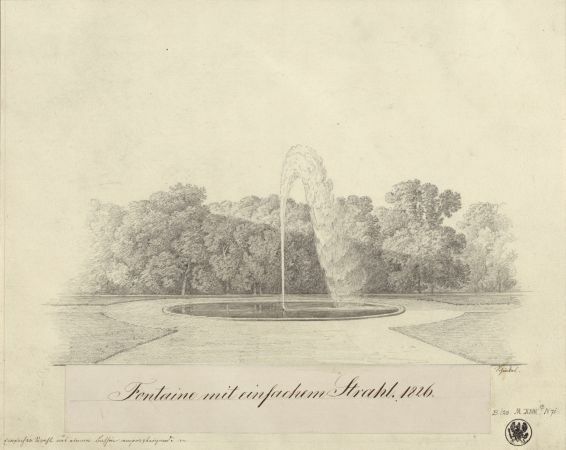 In addition to the museum's permanent exhibition, around 170 drawings by Schinkel were placed in a glass stand, which was probably located in the Green Room, and rotated at regular intervals. 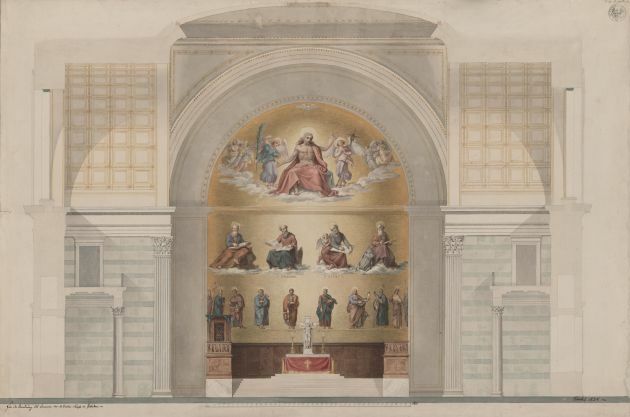 This presentation method was based on similar displays in London's National Gallery. 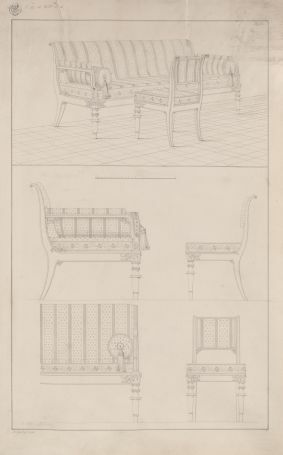 The drawings were numbered according to the catalogue and given titles. 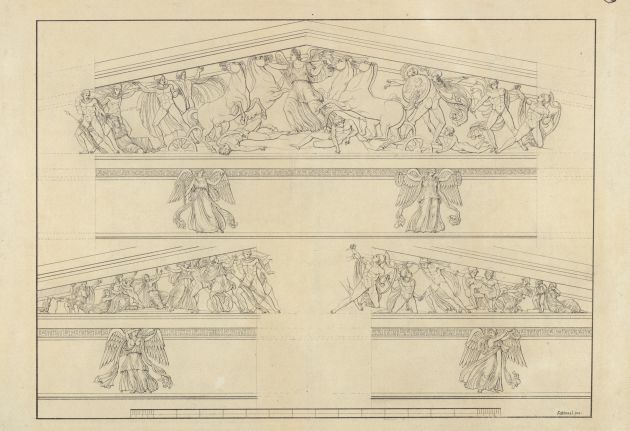 In the majority of cases, both classifications are preserved on the mounting boards.